I was completely oblivious to the impact Mr. Fred Rogers had on my life until I heard about the documentary, Won’t You Be My Neighbor. The amount of excitement I had to see the documentary could not be contained. Yet, when I tried to get other adults to attend with me, they were too busy “adulting” to go. Though I was busy as well, I felt it was worth sacrificing all of my tasks to watch this screening. I even had someone decline because they felt it was pushing a gay agenda. I took my 10 year old date and kept it moving. I also confirmed that we adults have things really backwards. I was told to arrive by 7pm and spent at least 30 minutes waiting before the movie started. Those that know how impatient I am, know I was on pins and needles. I learned about the Houston Film Fanatics group which is a group that writes film reviews for the Houston community. Once the film finally began, I couldn’t help but smile 80% of the time. I thought I understood how amazing Mr. Rogers was when I was a child, but the film brought back subconscious memories that I had not thought about in decades. My childhood was far from perfect. It is more accurate to say that most of my environment growing up was very toxic. Nevertheless, Mr. Rogers Neighborhood was one of the places I could escape and focus on love. I recall arguing with my older brother over the television as he wanted to watch WWF (and often won the fight). He also constantly called Mr. Rogers a weirdo which I always defended. After watching this documentary, I realized why I was drawn to him. Mr. Rogers was the first person in my life to teach me that being who I am (unapologetically) was fine. I always felt different whether it was at school, church, or with my family. No one in the world was like me. I even took it upon myself to visit my neighbors often and had no idea that was from the encouragement of Mr. Rogers. I even went to the mean lady’s house who’s house often smelled of urine (because she was a senior citizen with no help) and my family would wonder if their 6 year old had bumped her head. Sharing love with my neighbors gave me joy. Now that I am retrospective, I realize the senior citizens in my community understood my mission and appreciated it because they were often forgotten. Mr. Rogers was the advocate for those often overlooked. He was the inclusion movement. He understood that children were sponges and the impact of what they watched could shape their minds forever. It is amazing to me that evil still tries to persist but love still conquers all. I find it disturbing that as an adult, all I hear about Mr. Rogers is that he was gay. Even when I first heard that I still remember responding with, ok, I still love him. Well, the documentary addresses the fact that Mr. Rogers is not gay (spoiler alert). I also learned that he is an ordained minister, anyone ever here that one? No! We need more people like Mr. Rogers on television. People who genuinely care about the well being of children. Not marketers exploiting children to increase market share. I applaud Mr. Rogers for encouraging me to be me. For accepting people as uniquely as they are. For focusing on inclusion before it was as a hot topic. My four year old self knew his authenticity and will forever be grateful for access to public television that gave me access to someone like Mr. Rogers who genuinely cared for me. 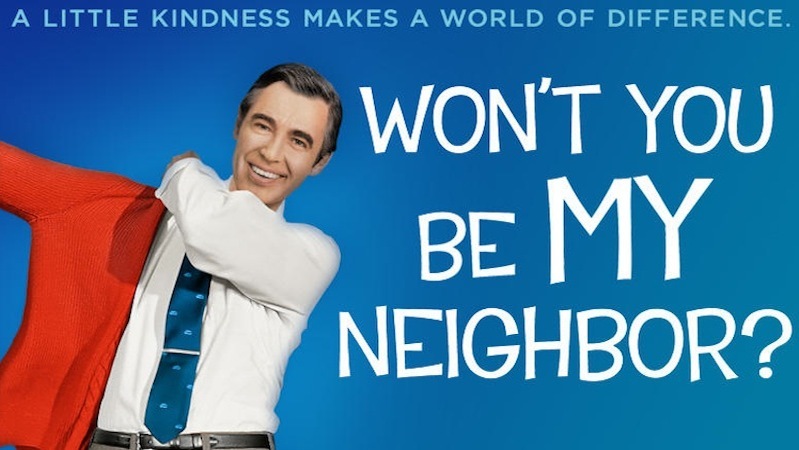 Go see Won’t You Be My Neighbor at River Oaks Theater starting June 15th. As New Orleans is completely focused on celebrating Mardi Gras 2018, you would be remiss if you are in town and miss Prospect.4. 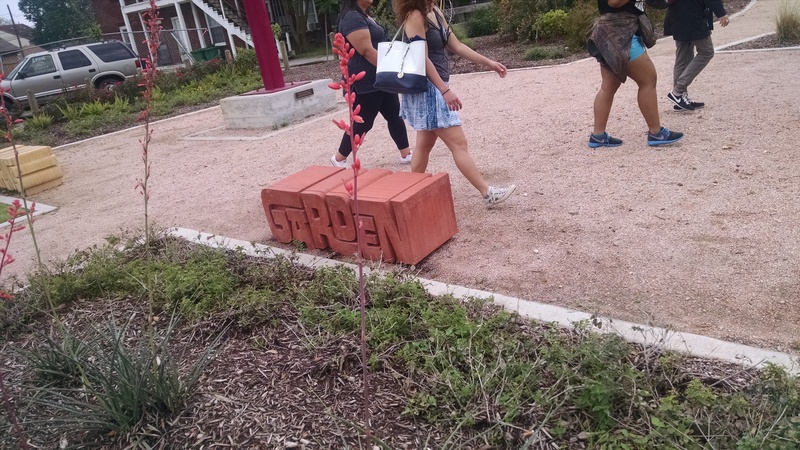 Prospect is a citywide triennial of contemporary art displayed all over New Orleans. The artists range from local to international. 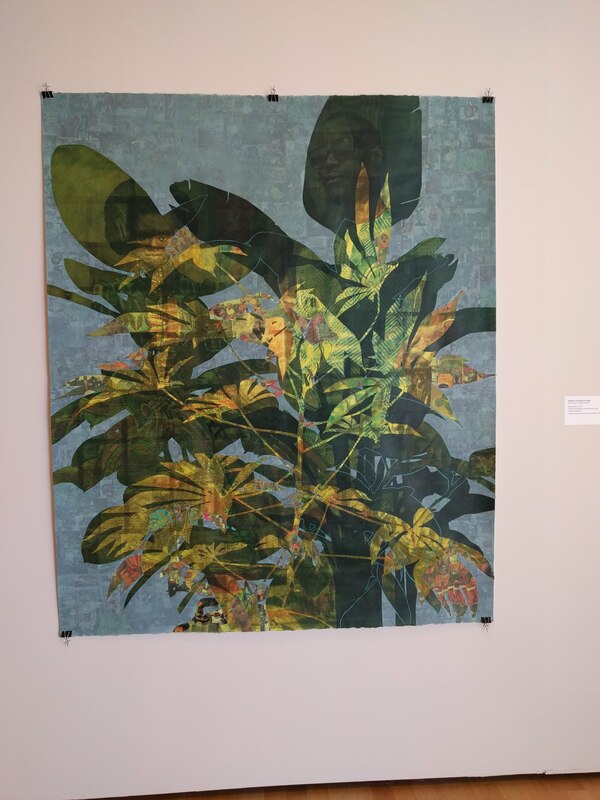 Created by Dan Cameron, a world recognized curator, he brought the idea to New Orleans in 2007 with seed money from philanthropist Toby Devan. 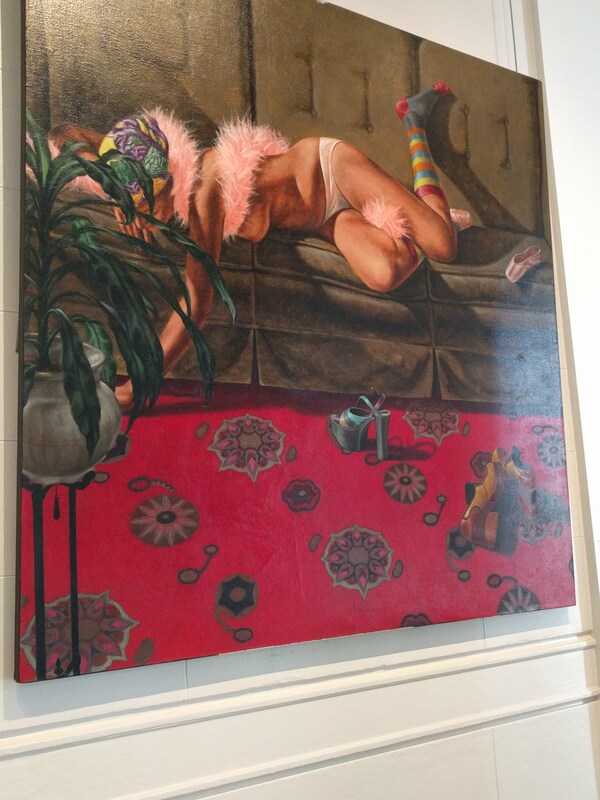 The art is exhibited all around New Orleans, including traditional museums like the New Orleans Museum of Arts (NOMA) to non traditional art venues, including public art. Prospect is able to intertwine the rich New Orleans culture with artists from around the world to create a seamless benefit to impact New Orleans culturally and economically. 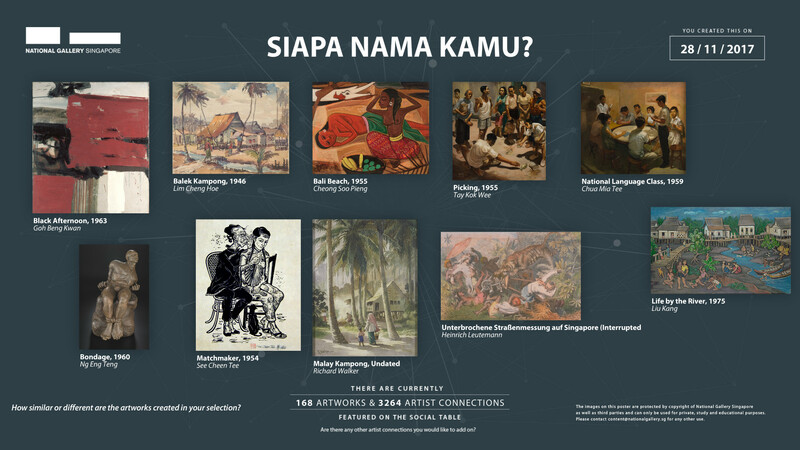 I found out about the exhibit from an Artsy email and I am glad I caught it. 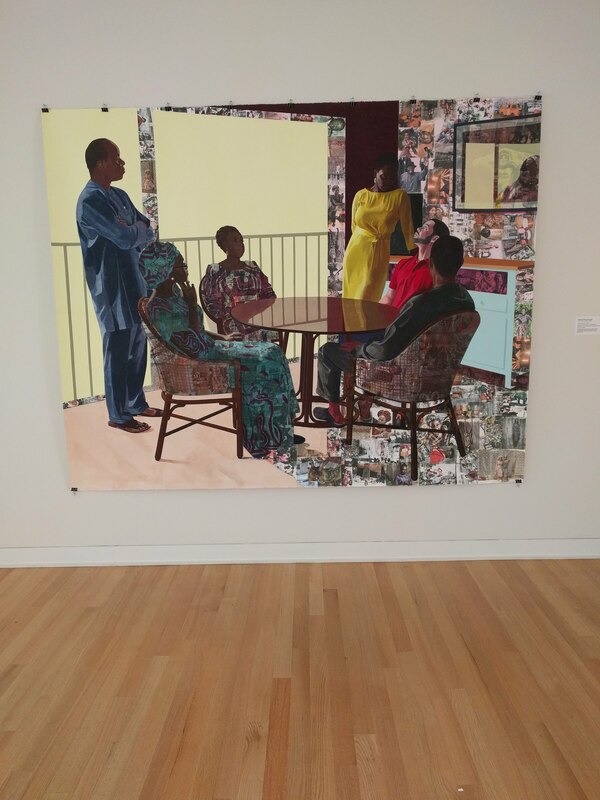 Immediately, I fell in love with the work of Njideka Akunyili Crosby and had to figure out a way to get to New Orleans to see it. With a quick flight to New Orleans from Houston, I literally drove from the airport to NOMA. 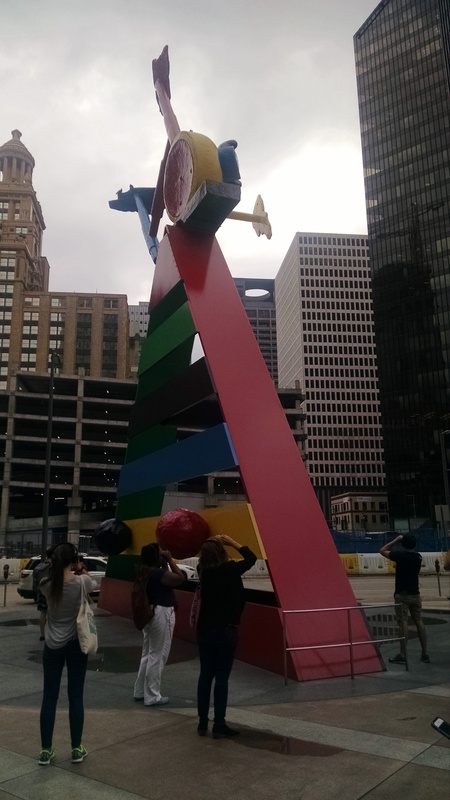 I did not have a lot of time on this trip so I had to be very strategic with which pieces I could see. 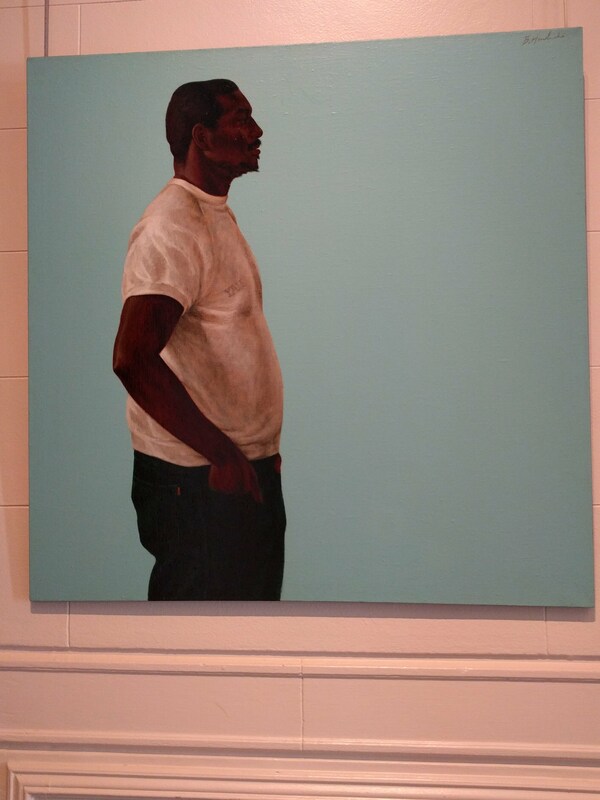 As soon as I entered NOMA, I was greeted by pieces that immediately blew me away. 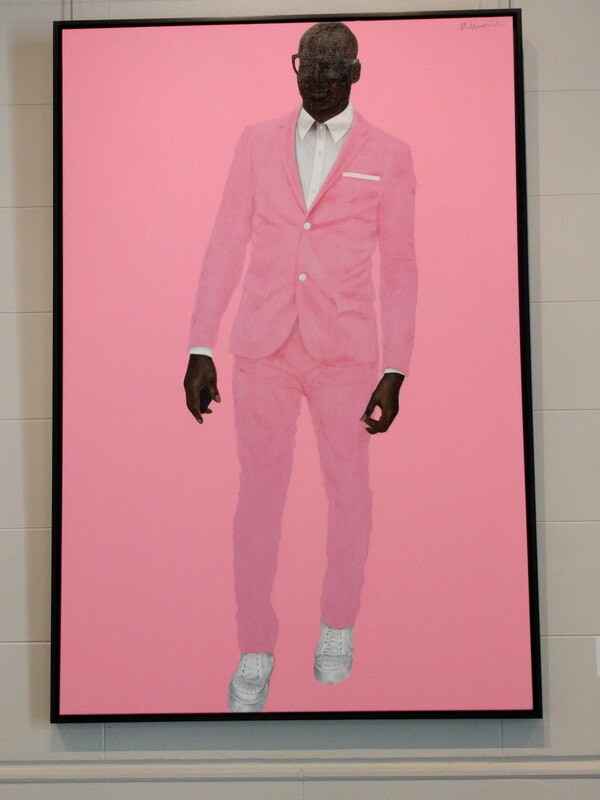 I had never heard of Barkley Hendricks, but his work left you remembering that they are unforgettable. While I learned more about Mr. Hendricks, I realized he recently passed away in 2017 (RIP). 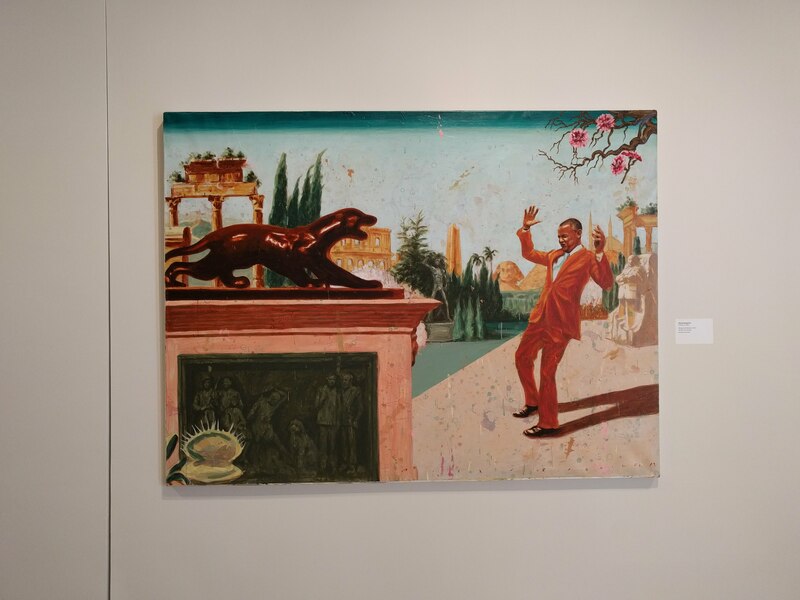 All of the pieces exhibited, were recently purchased from his estate and on loan for Prospect.4. I am very grateful to the collector that allowed us to witness the magnificence of his work. I was emotionally full before I even made it to Ms. Crosby’s work. Yet, I had no idea I would have the response I did when I explored her section of NOMA. I burst into tears as soon as I saw it. 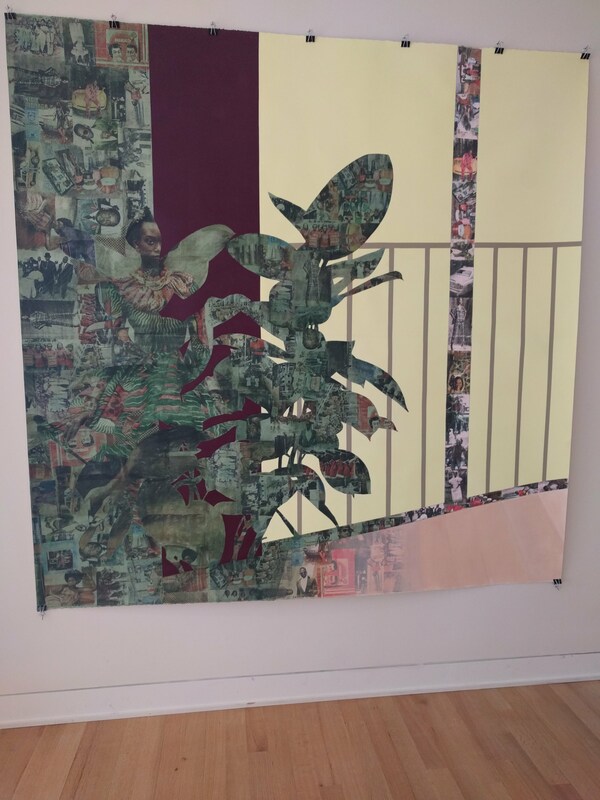 The collages were not like anything I have ever seen. I was also overwhelmed thinking about how blessed I was to go from a goal to visit by reading an email to a very short time before I was standing in front of masterpieces. 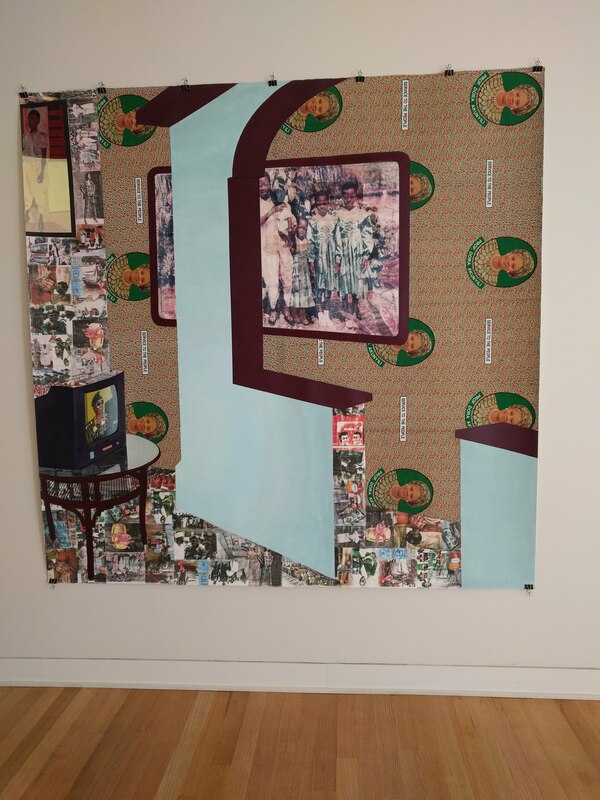 As you look closer to her collages, you begin to see some materials from magazines from Nigeria. 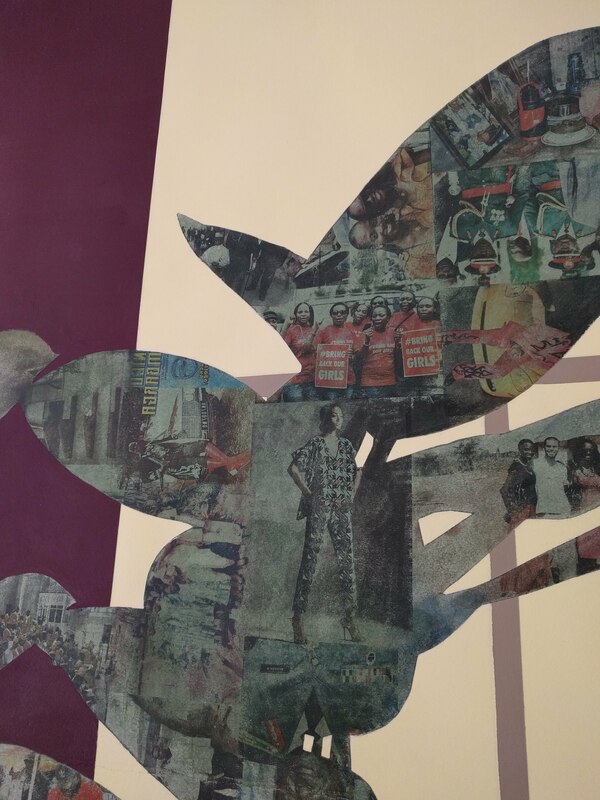 There is an overlap of Western and African culture with small messages throughout each piece. These pieces felt like they represented me. A gumbo of many of life’s experiences and cultures, never fully understood by the naked eye. 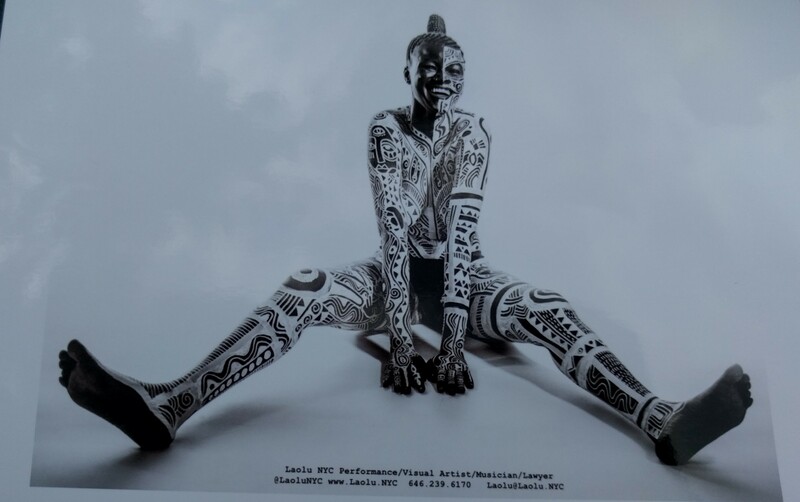 Next, I ventured off to an Afro-Cuban artist Alexis Esquivel. 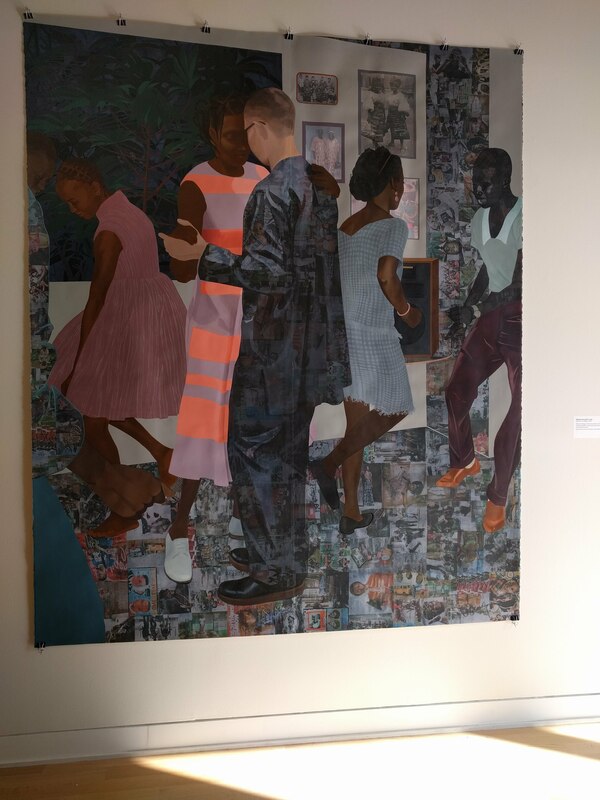 Still processing Njideka’s work, I now had to evoke emotions by seeing our former President in paintings placed in Cuba. A beautiful play of fact and fiction, I enjoyed experiencing the depiction from Alexis’s lens. Often people look at travel as being only available to the wealthy but I beg to differ. The way to optimize travel and reduce cost is by having excellent credit. If you have credit difficulties, focus on fixing that first before you venture to plan the next big vacation. A Houston based organization like Money Management International, could help you get on the right foot. 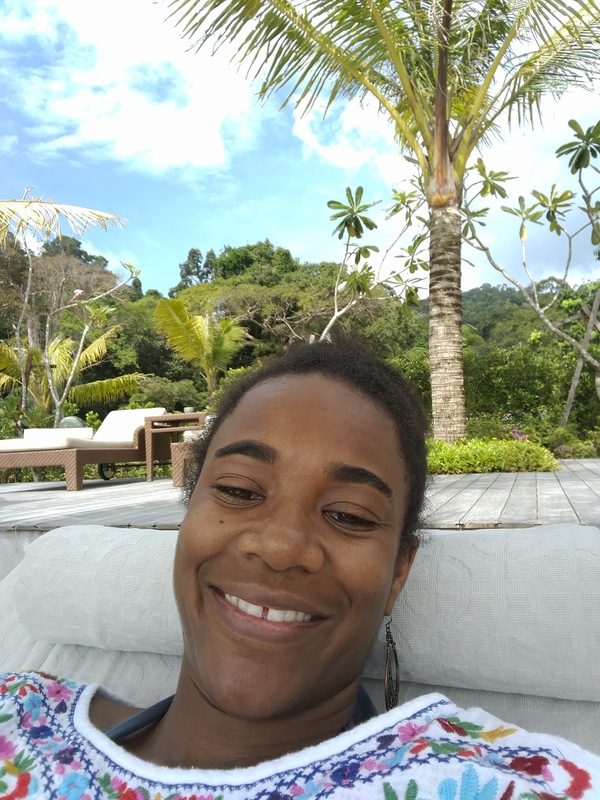 If you are already there, I will share some tips that took my vacation from a 7 to a 10. 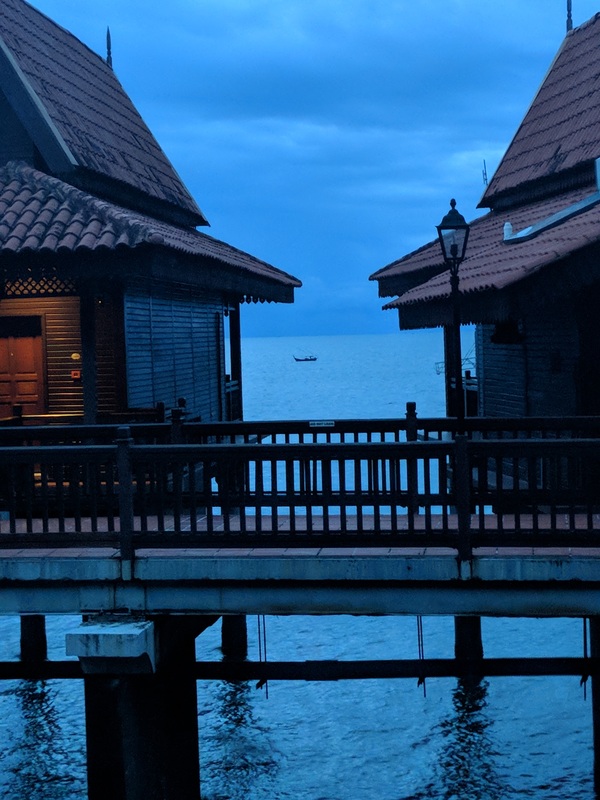 Initially, I started following posts from The Points Guy and studying tips on which travel credit cards are best (note, I had a very established credit history before I got into this game. I always pay off balances to avoid interest fees). I was hesitant to have more than one credit card but now that I have learned the game, it really makes sense to have cards for brands you gravitate towards. Yet, to be smart with your credit utilization, you don’t need a million cards. Two to three can make a difference as long as you have the discipline to not fall into a trap. My favorite is Chase Sapphire Reserve because it gives you 3x points for travel (ride-sharing, planes, buses,etc) and Restaurants (in addition to paying for global entry, lounge access, and more). Yet, the best part is when you use the points for travel, you get a 50% bonus towards the trip. For a cherry on top, you still earn frequent flyer miles for the trip booked with points (For example, since I love math, let’s say you use the card to buy a $200 flight. You will get 600 points, which basically is equal to 900 points or $9 toward a future flight. The points add up very quickly). Lastly, of the $450 annual fee per year, you get $300 reimbursed to you when you use charge travel (ground or air). You can very easily have the card pay you if you use it wisely. In addition, some hotel cards will give you nights towards status or like Intercontinental Hotel Group (IHG), instant platinum status if you have their card. This entitles you to earning bonuses on hotel stays, late check-out (4pm), etc. When combining a travel card and a hotel card, you get the best of both worlds. I am a big fan of Marriott, so it was imperative I get the Marriott card. Lastly, getting specifically to my last international trip, another tip is to follow or subscribe to alerts such as Scott’s Cheap Flights, Escape Houston or Airfare Watch Dog. That is exactly how I scored a ~$350 round-trip United ticket to Singapore from Los Angeles. With Scott’s Cheap flights, you typically have to decide quickly. After an hour of booking, the flights shot back up to $700+. Sometimes, when it is deemed an error fare, you should wait until it is confirmed to book any additional plans (but don’t be like me and think you booked your Houston to Los Angeles flight but actually find out 11 days before your trip that you didn’t. Yet, thank God for redeemable points from Sapphire Reserve for your $100 flight to $300 flight error, whew). Once confirmed, it was unbelievable that you could get a total round-trip ticket to SE Asia for less than $500 round-trip. I decided that Singapore, though a great city, was not enough to go that far to see. I had been to Singapore before and figured it would be a great place to start the jet lag process, but wanted to venture somewhere else. After much deliberation, and advisement, I decided on Langkawi, Malaysia. I know Malaysia still is associated with the horrific disappearance with Malaysia Airlines (RIP), but you can’t live in fear if you want to travel and explore the world. It is counterproductive. For $100/roundtrip from Singapore, I opted to take the risk. It was fairly simple to book American chain hotels in Singapore (and I stayed with a brand where I have status). Yet, Malaysia was new territory for me. I engaged Uniglobe Travel Designers and they made everything seamless. 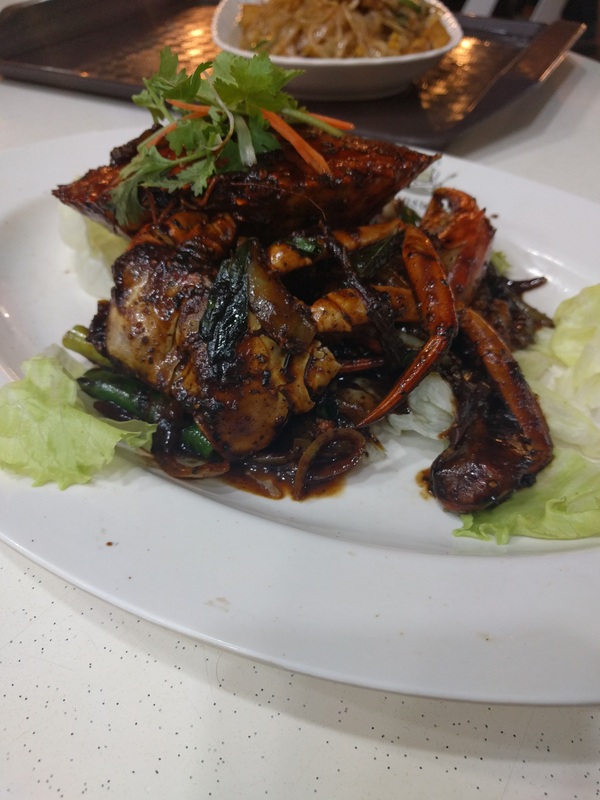 We were able to find a hotel for a reasonable price and an airport transfer (I am so happy I had a driver when I landed because there is nothing like getting in a random taxi in a country that you are unfamiliar). Unfortunately, it rained a bit in Langkawi which is surrounded by outdoor activities. Rainy days became rest days (rest and eat, repeat), I was able to get a wonderful spa treatment (mud & aloe wrap 50 mins+ 50 minute deep tissue massage) all for $90. 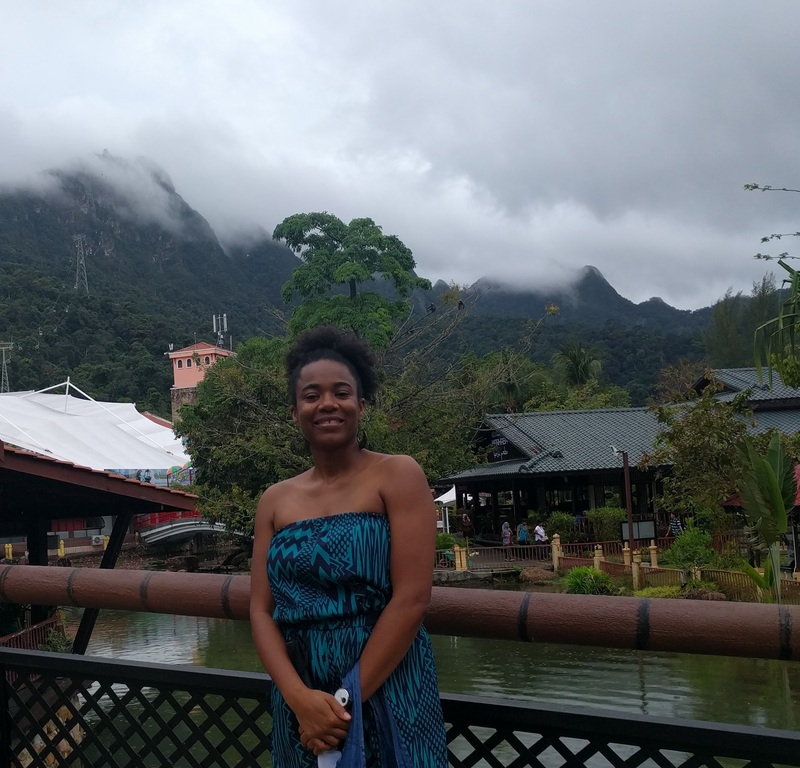 The dollar was going very far in Malaysia and I slightly didn’t know how to act. The food was amazing as well. Though, I didn’t have the budget to stay at the almost brand new Ritz Carlton the entire time, I am glad I had the contrast. 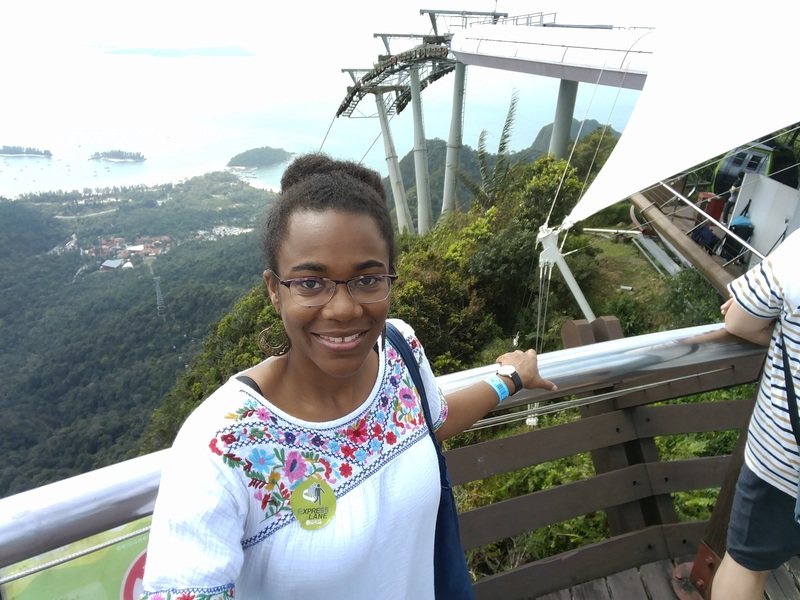 The rain and clouds finally stopped, so before we left the budget hotel, we were able to visit the Sky Cab which was within walking distance. I am so grateful the weather cleared up because not being able to see the views would have diminished the entire experience. When we arrived to the Ritz Carlton, I felt like I stepped into a real life Zumanda. It was less crowded, the kids club was exciting and not an extra charge. The room was amazing and staff beyond hospitable. 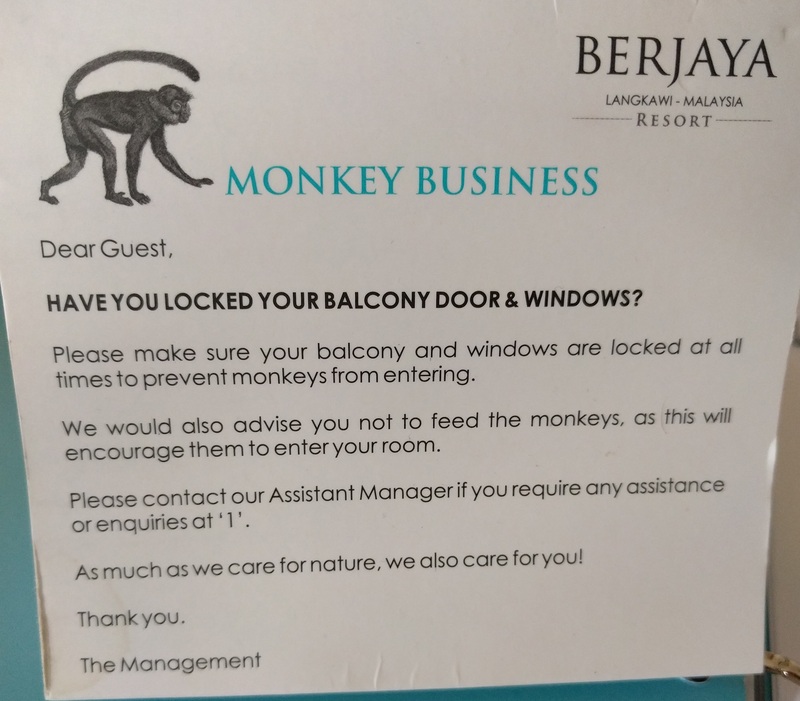 The monkeys were a bit more aggressive, but hey, I am in their space so, I should be grateful they allowed me to visit. We went back to Singapore one more day before our trip and finished it off with a visit to the National Gallery. Interestingly, I had not been there before and it reminded me that you can never see all of a city. There is always something more to see. The art was amazing at the gallery. It was refreshing to see such a variety of artists (mostly from Singapore and Malaysia). The views of Singapore from the building were also amazing. We went back to the JW Marriott with a new perspective than when we arrived. I was grateful that their lounge access included breakfast, afternoon tea and evening cocktails. Yet, having traveled almost 17 hours to get there, my favorite amenity was them laundering 3 items for free. In short, it does take some money to plan for a trip, yet there are ways you can stretch the dollar by combining it with loyalty programs and branded credit cards. With only a week to spare, we were able to experience another part of the world which always is a blessing. I encourage you to choose new places to travel, yet try to look up their customs before you go such as tipping, dress and top things to do. Lastly, be flexible and open-minded to experience a culture different from your own. I have been drawn to visit Belize for at least 5 years. When Southwest created a direct flight to Belize from Houston, it made the dream more of a reality. I had absolutely no knowledge of the island. My podiatrist’s assistant told me about her homeland, which increased my desire to visit more. I finally made the dream a reality MLK Weekend 2017. I began purchasing parts of my trip in pieces. I was able to attend the Eyes For You fundraising gala and was the highest bidder for a 3 night stay in Belize. I was happy to support a great cause while beginning preparation of my trek to Central America. The second portion was purchased with a Southwest Voucher due to suffering through a 3 hour flight with no air conditioning. I caught a Southwest sale where I had to debate between Art Basel Miami, a visit to Atlanta or Belize for about the same price. Belize won. When I went to reserve my hotel, I quickly learned that there were layers to this journey. 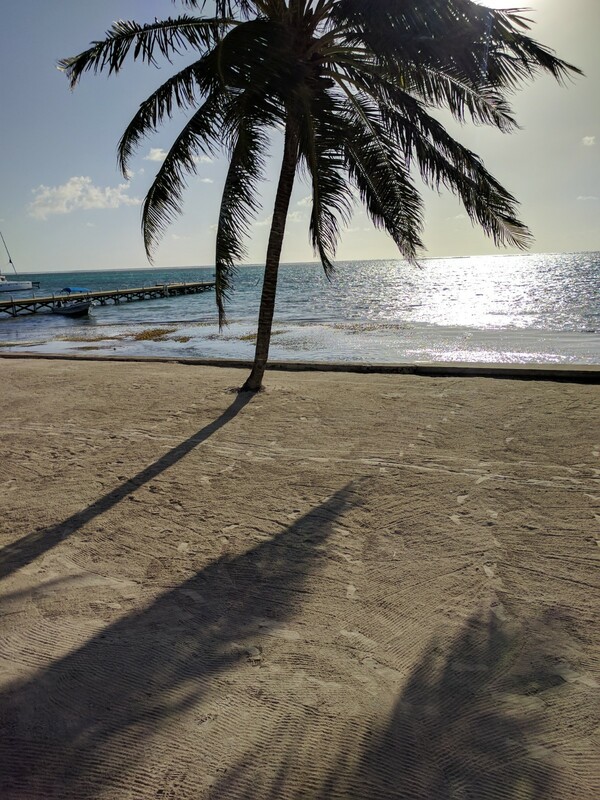 Somehow, I missed that the stay was on an island (caye, pronounced key) which was a distance from Belize City. My flight was landing after the last run of the water taxi so I had to purchase a local domestic flight (which was near the price of my southwest ticket). I arrived in Belize City seamlessly on Southwest yet started to panic because I did not write down my connecting flight number. I also did not have a plan on what would happen if my Southwest flight was delayed and I couldn’t make the connection. Thankfully, I found my flight on Maya Air after the desk agent from Tropic Air verified I was not flying with them. I have flown in a Cessna before so a small plane does not scare me very much. Yet, flying over water in a Cessna is another ball game. I recall my connecting flights out of Puerto Rico on American Airlines to the Caribbean, but never did I take a similar journey on an airline that I had never heard. I had to calm my nerves and use the time to take in the scenery. The view from the plane was just the beginning of views I would have from Ambergris Caye. I landed at night, which I later discovered is new for Belizian pilots. I did research that my hotel was across the street from the airport. I waited on my bag and walked around the corner to the hotel. I observed immediately that golf carts are the major mode of transportation and they are frequently buzzing through the streets. 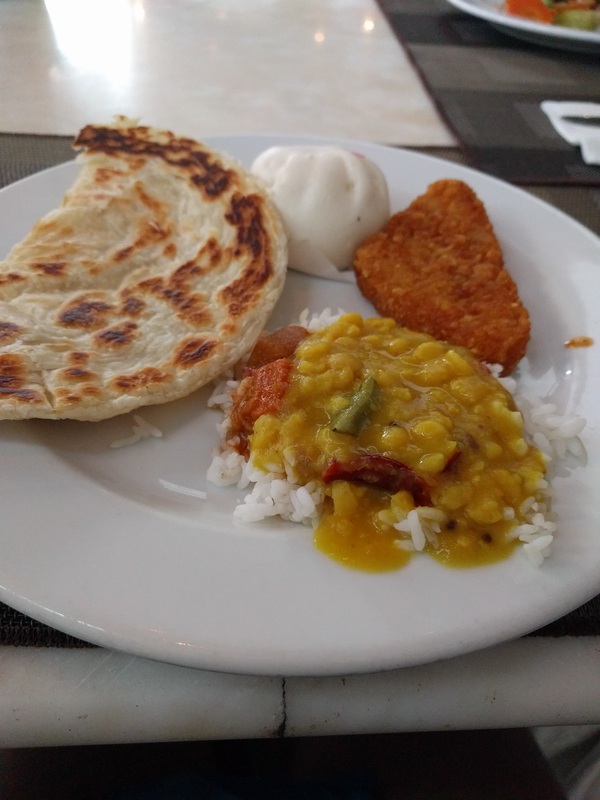 I arrived at the Sunbreeze Hotel tired and very hungry. The first thing I learned was the hotel restaurant would be closed for dinner for two nights and as they were having a fundraiser for Oceana (an organization that protects the reef). Through clinched teeth, I tried to comprehend no food and was not excited to have to explore to go somewhere else. Yet, two great things came out of it. I registered for the event for Saturday night and I explored eating outside of the hotel. I made it to the local spot of El Fugaon. They had live music that night (which I have learned is rare). I had a wonderful waiter that was very “Americanized”. He and I chatted about the NBA and I had to learn from him that the Rockets were having a great year (I should be ashamed that I didn’t know that). 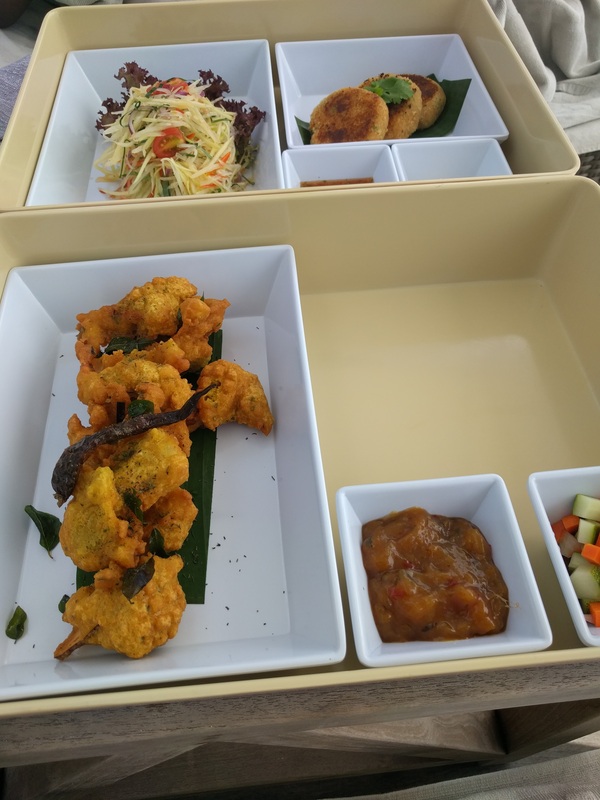 I saw conch fritters on the menu but ventured to try grilled conch. What was best about the meal was the pepper sauce I requested on the side. It was phenomenal. The meal was great but I wanted it to have a bit more heat (temperature). 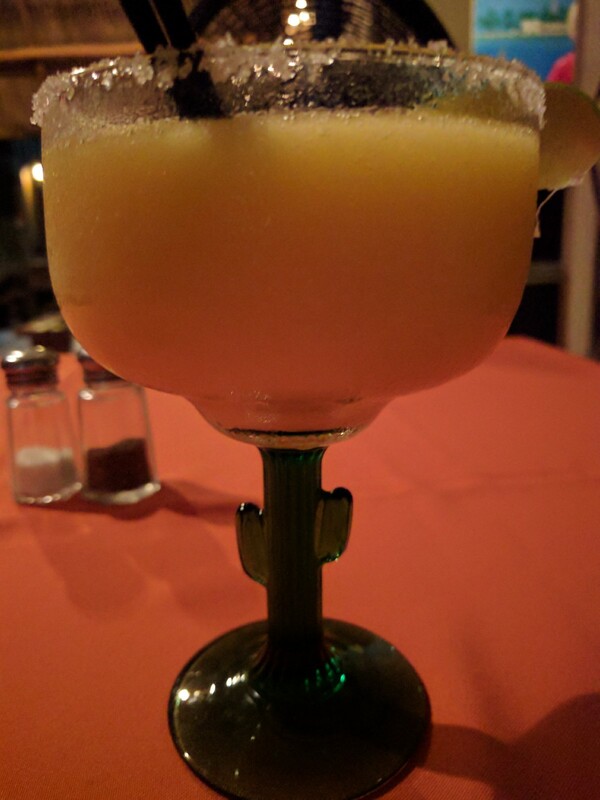 I enjoyed my margarita which was the freshest mango margarita I have ever had. I spent a bit of time trying to disconnect from social media and texting and was successful for 24 hours. Unfortunately, wifi was available so it made it hard to break the habit. I spent Saturday relaxing and despite being told Belize is a party mecca, I found exactly what I was looking for, peace. I wandered through the town of San Pedro and found it interesting how quickly I could “blend” like a local. I also saw the difference in price gauging. 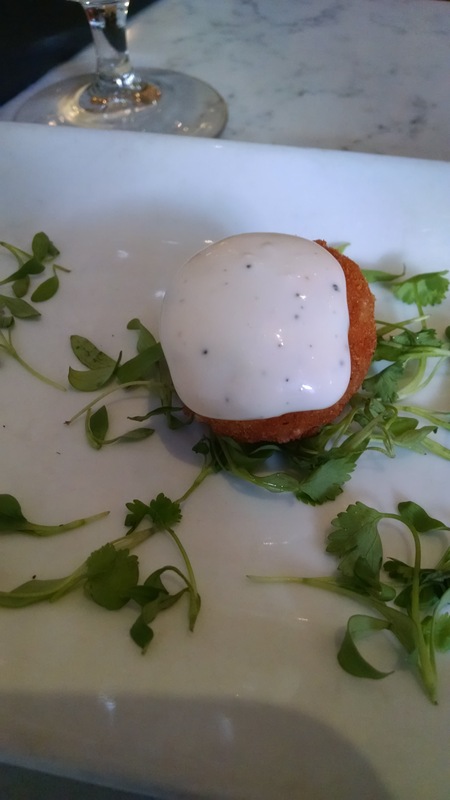 The conch fritters at El Fugon were $10BZ. I went by a Jerk Place off the beach and they were $24BZ. The currency is about 1:2 for the American dollar, but I could not bring myself to spend that much more. I knew I would eat well that night and ended up just snacking until I got to dinner. Dinner started at the Blue Fish Grill with cocktails prior to the kickoff. We had italian spritz’s curated by Talia Baiocchi who is releasing a book on spritz recipes. The spritz was a great kick off to a wonderful night. Many of the attendees were immigrants who are now living in Belize (either permanently or occasionally). 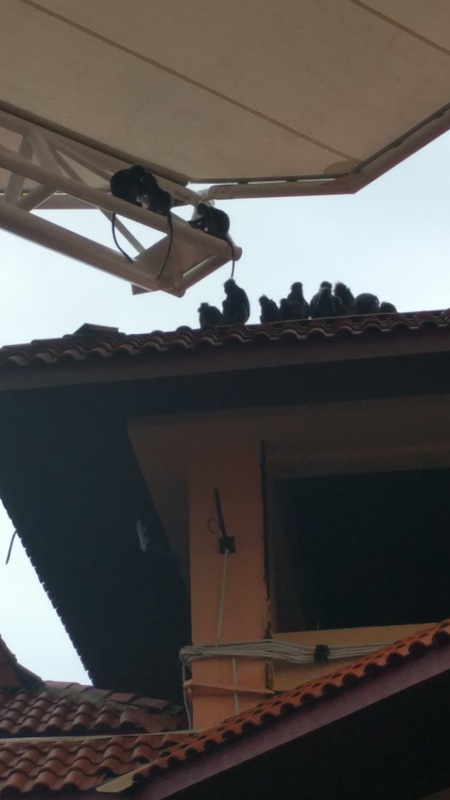 Some guests, flew back just for the event. I was very happy I decided to attend. It was a great way for me to learn about Belize from their lens. In addition, the owners from Blue Fish Grill have Houston roots. They had 4 featured chefs per night, and Saturday included a chef from Houston’s Tasting Room and Anejo, Alberto Gutierrez. His dish was a black fin tuna crude, sopressatta-panzanella, flor de jamica, balsamic vinegar and spicy cashew butter. The spicy cashew butter was to die for. In addition to the wonderful meals prepared by Amy Knox (Wild Mango’s), Missy Robbins (Lilia) and Chris Aycock (Blue Water Grill), we had wonderful wine pairings. My favorite take away from the wine were the 2014 Puligny Montrachet and the 2014 Chassagne-Montrachet. I will be looking for those stateside. The dessert was featured by the Belize Chocolate Company which I stopped by earlier in the day to sign up for a chocolate class. 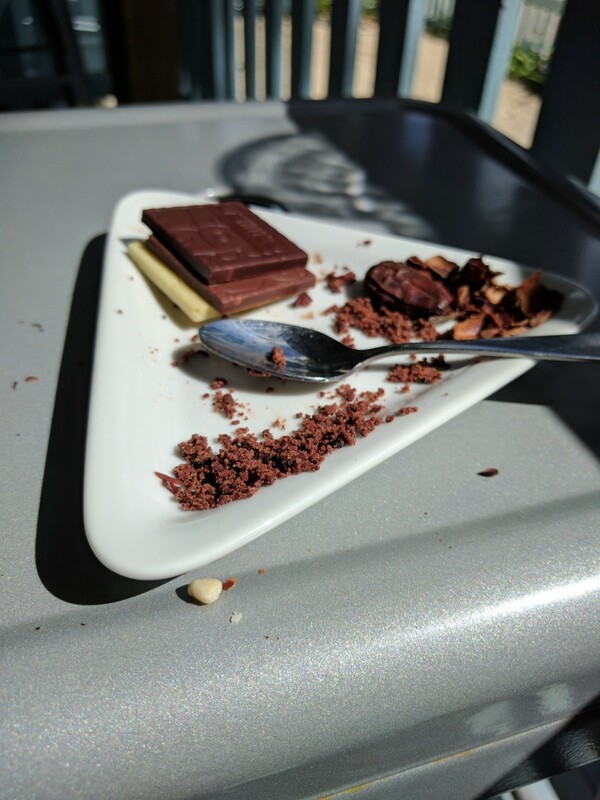 We had a 70% Kakaw Belizean chocolate truffle, wangla square, and and cashew gianduja, all very decadent. All of this food was great preparation for the journey I would have Sunday. On Sunday, I ran for a quick breakfast at the Blue Water Grill and had one of the best pancakes I have had in a long time. I typically don’t like pancakes outside of the states but these hit the spot. I then went to the Amergeiss Dive Shop to begin my snorkel excursion. I immediately recalled my experience snorkeling in the great barrier reef. Yet, the sharks were a little hungry that day. There is something about being in the ocean that you are forced to acknowledge God’s majesty. My experience in Belize was well worth the 5 year wait. I am confident I will be back soon to explore more. I am very grateful that I was able to explore, meet new people, but find a bit of home once I arrived. I highly recommend a visit to Belize. I have to go back and explore Belize City (especially the caves). How was Curlfest? I was asked that question 10 times in the last 24 hours. My reply: Wonderful! 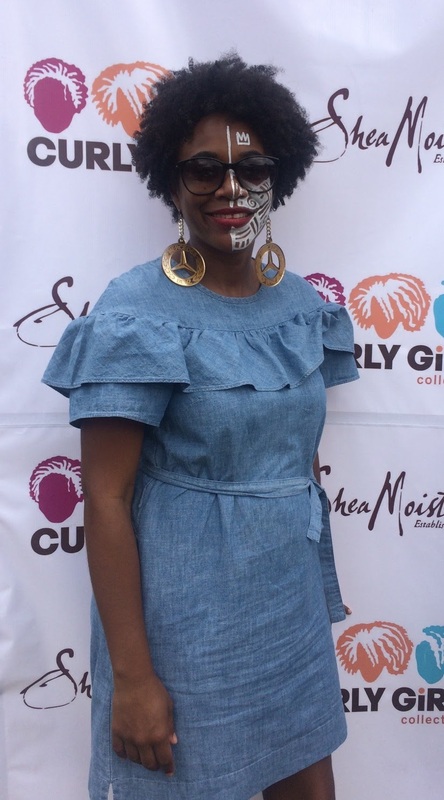 Curlfest launched in 2013 by the Curly Girl Collective as a festival to celebrate women of color with natural hair while linking them with the best brands supporting the movement. 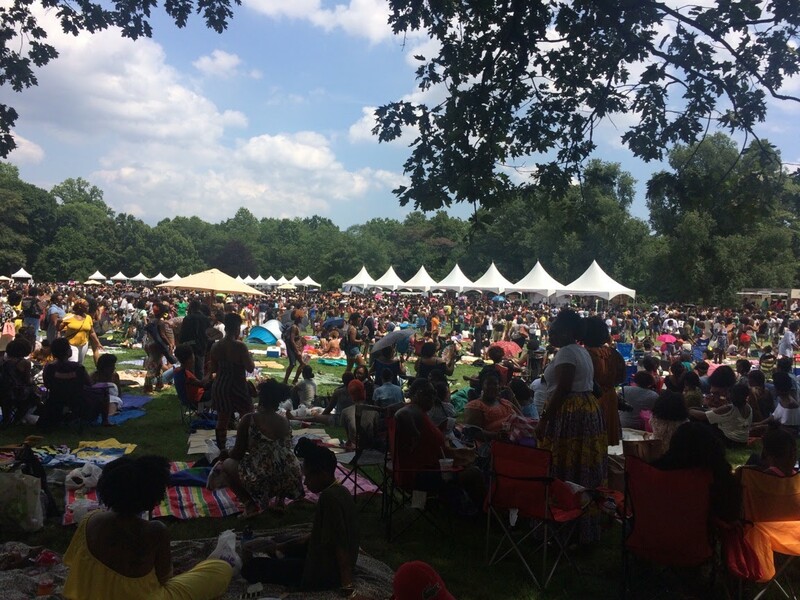 Curlfest has been held in Prospect Park (Brooklyn, NY) in the middle of summer. It is a perfect example of utilizing social media to accelerate a movement. 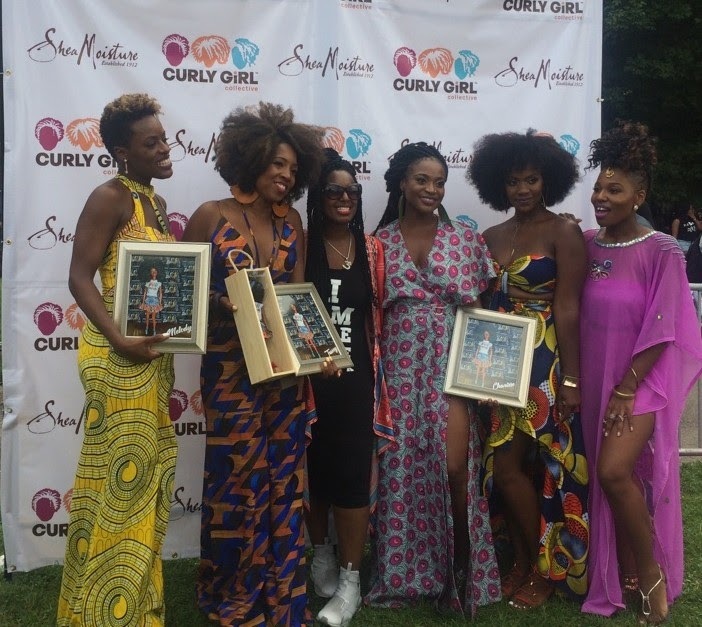 While attending Curlfest, you could not help but feel empowered. Whether your hair is curly or straight (you would feel a bit out of place with straight hair but all are welcome! ), there was a strong sense of pride which is rare in gatherings lately. There were a plethora of t-shirts with strong statements, ankara prints, children rocking their fros. 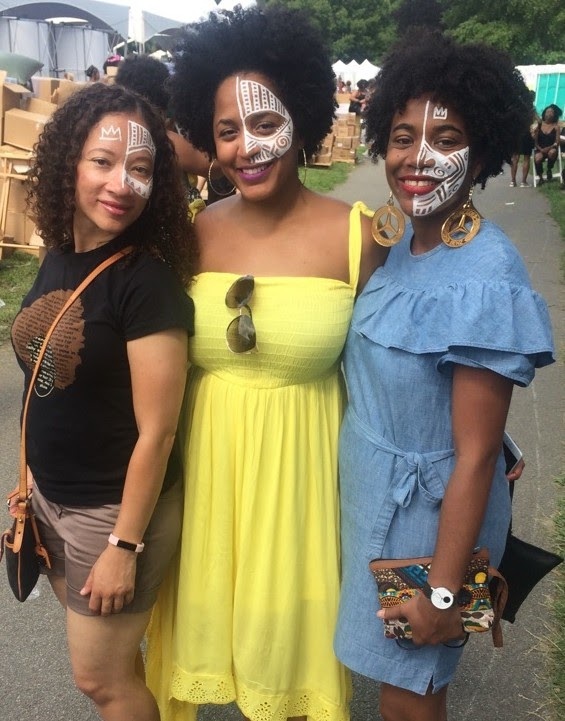 It felt like this was the black girl magic version of woodstock (minus the drugs). We felt free, together and a part of a cause no one could deny. This year, Spike Lee was in attendance and spoke to the crowd. One message that stood out was him commending the crowd on their beauty while demanding we take command of the economics of our power. Spike has a valid point as the natural hair care industry is now valued over $500B. Wouldn’t it be a shame that we don’t profit by providing brands for us and by us. 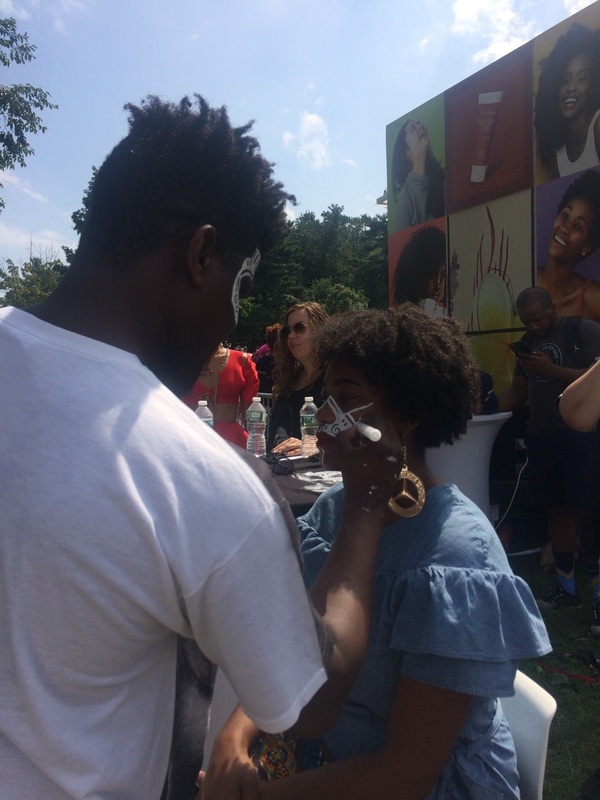 In addition to visiting vendors and booths, we were able to get our face painted by the artist Laolu. We waited in line for an hour, going well beyond his closing time, to have our face become canvasses based on Yoruba sacred traditional art. We officially were touched with the energy of our ancestors which was carried with us the entire day. The face art invited conversations and requests for pictures well beyond our expectations. The day was hot but it did not stop anyone from dancing to the music blasting from the stage. It did not take long to run out of things to do, but the long lines made time go by fast. 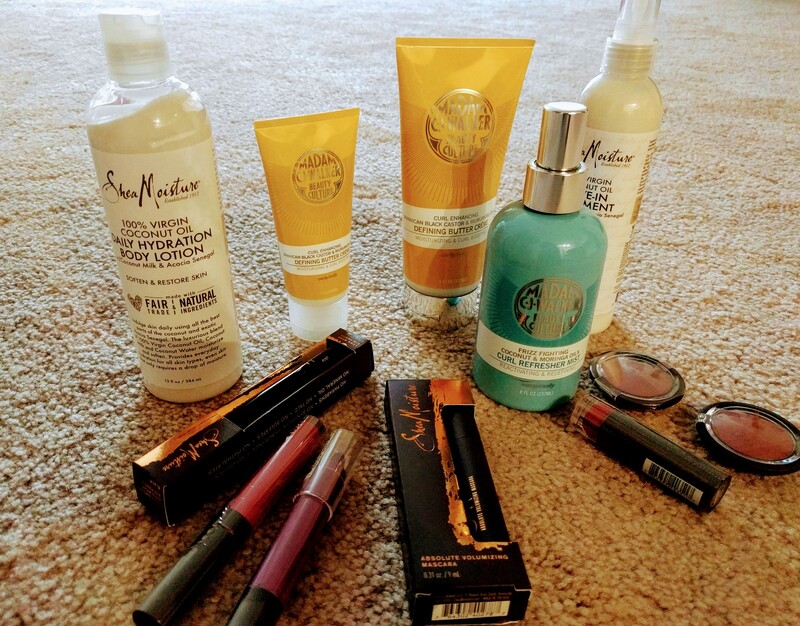 The best find was a bag of products from brands such as Madame CJ Walker, Shea Moisture , etc. For $35, we were able to grab this to go bag, with a curl fest tote and a much needed coconut. It was definitely a bargain because I am sure it is valued well over $100. Curlfest is destined to get bigger and bigger. It was an amazing experience without any drama. We all came and had a wonderful time and left with stories for years to come. It was wonderful to see children soaking up the beauty of our people from all over the diaspora. I strongly encourage a visit to Curlfest in 2018. 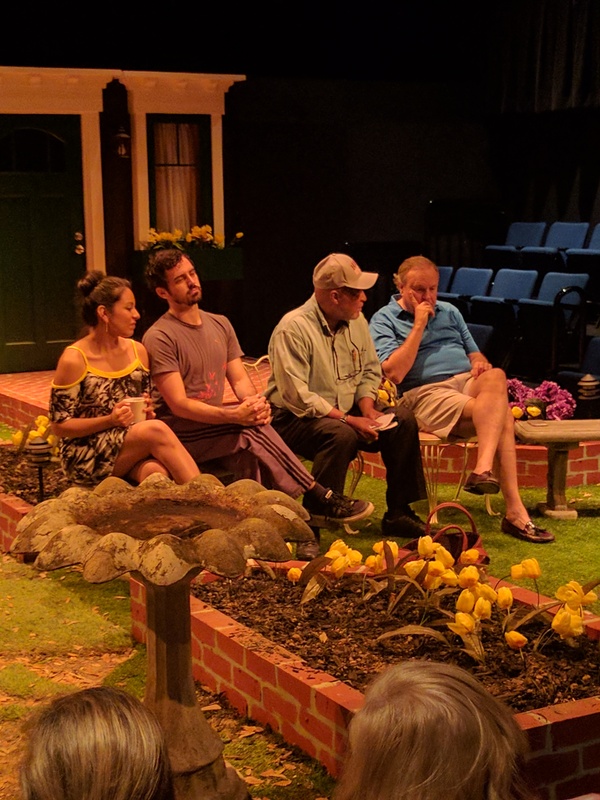 Native Gardens is a play by Karen Zacarias and directed by Brandon Weinbrenner currently playing at Main Street Theater. Native Gardens brings together experiences everyone can relate to, dealing with neighbors. Across all walks of life, everyone has a story about their neighbor. I personally grew up in a house that was in my family since the 1950s and the neighbors were there for almost just as long. The parents, kids and even grandkids grew up playing with each other over decades. And like Native Gardens, when there was conflict, there was CONFLICT. It was refreshing to see Native Gardens bring together four characters that collectively represented our experiences but also individually had their own struggles. Issues from immigration, sexism, classism, racism, ageism were all addressed, all in about 60 minutes. The actors did such an awesome job I often forgot that I was watching a show. 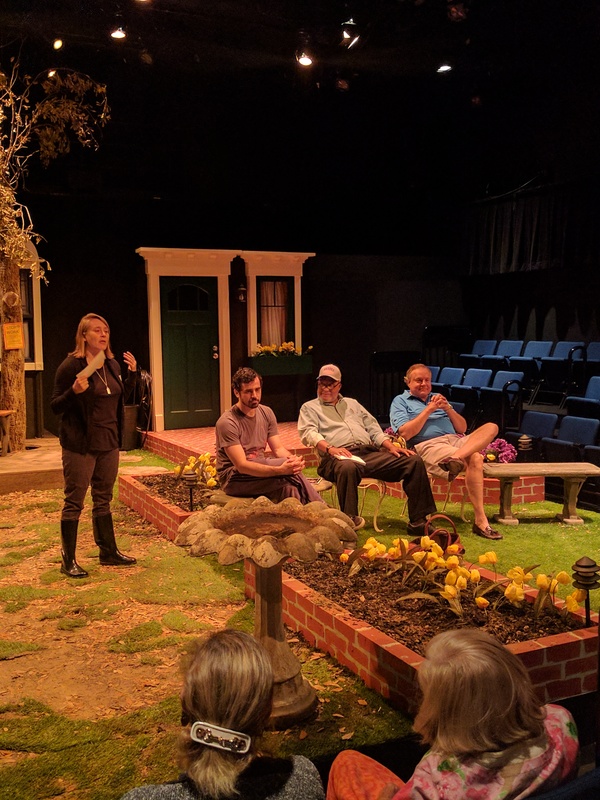 The show also centered around gardening and we had a talk back with actors and a Master Gardener. Being in the 4th largest city in the country and restaurant mecca, it is often overlooked that we have a strong gardening community. I learned about Houston’s Community Gardens from Master Gardener Terry Garner during the talkback. I was pleasantly surprised to learn about classes for city folk without a yard. Container garden classes (and more) are taught at the Palm Center Community Garden every 3rd Saturday at 10AM. I was also blown away that there are 12 garden multi-service centers in Houston. The gardens produce over 50,000 lbs of produce a year. They have a farmer’s market every 2nd and 4th Saturday and are always looking for volunteers. I have been using the excuse of having no yard for not gardening but now that has been blown out the water. Also, my excuse of becoming involved with theater, perhaps even acting. During the actor talkback, I heard a common theme with the actors who all had a corporate career but always came back to theater. I realized after listening that I indeed had met one of the actors before and it wasn’t just from another show. He is a Carnegie Mellon (go Scots!) graduate with a chemical engineering background (are we getting close to home or what). We spoke afterwards and he encouraged me to “come back home” as we have so many choices of community theaters to start. So, I take it as a charge to put on my vision board that somehow, I will be on a stage soon (relatively). Now, I have to have you hold me accountable. Until then, please go see Native Gardens as it closes June 11th. 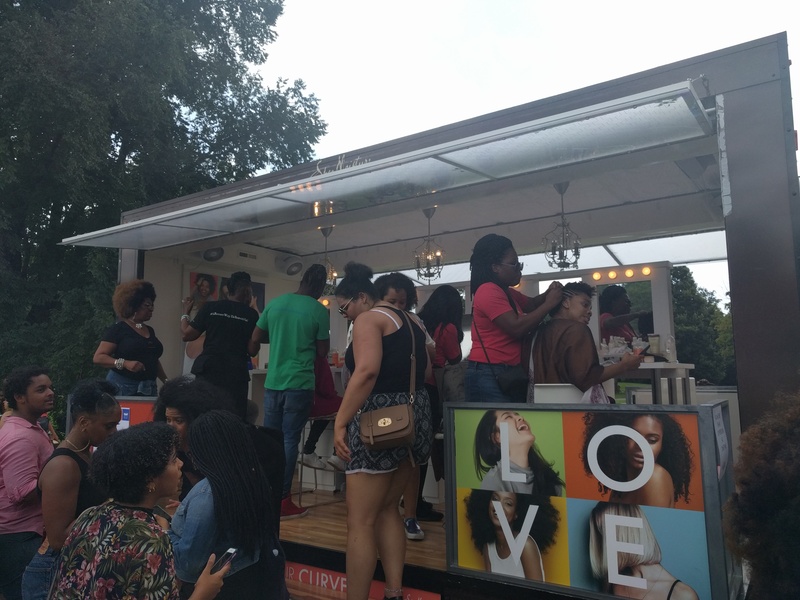 Luvvie was in Houston today and took all 500+ of us by storm. Though Luvvie has a small frame, her life and words come with a big punch. Luvvie represents what it means to be underestimated yet surprises her under-estimators. 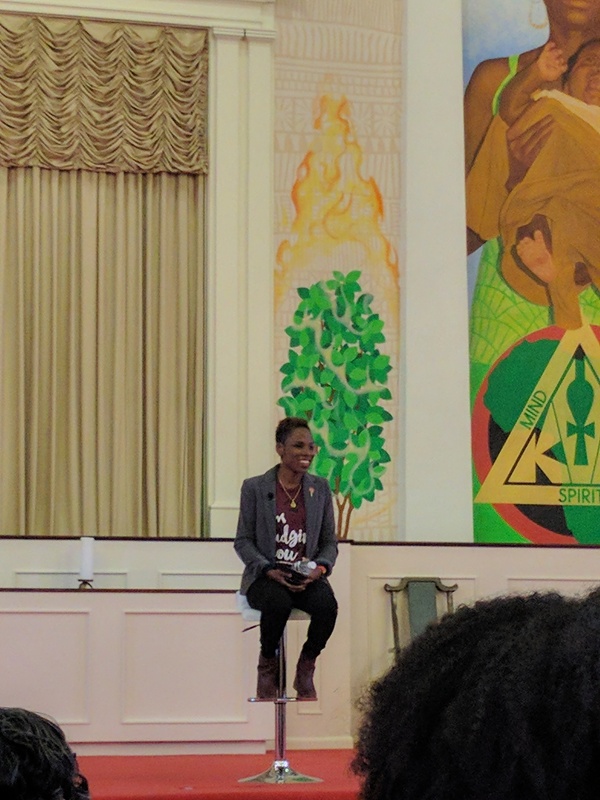 During her keynote hosted by the Houston Museum of African American Culture, she blew us away with an overview of her journey starting in college. 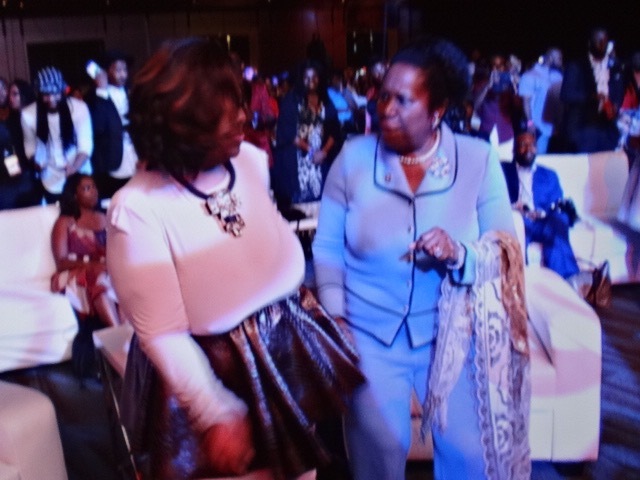 I, along with many, walked away feeling motivated like we had just left a Joel Osteen sermon (yet with Luvvie style). I profess, I do not consider myself one of the Luv Nation (though I am in the BeyHive), I realize I have been reading Luvvie at least since 2014. Now, that I am an official fan, let’s share the 15 tips I learned from her keynote. It was amazing to learn how Luvvie went from a psychology/pre-med major at University of Illinois to writing in her college newspaper. 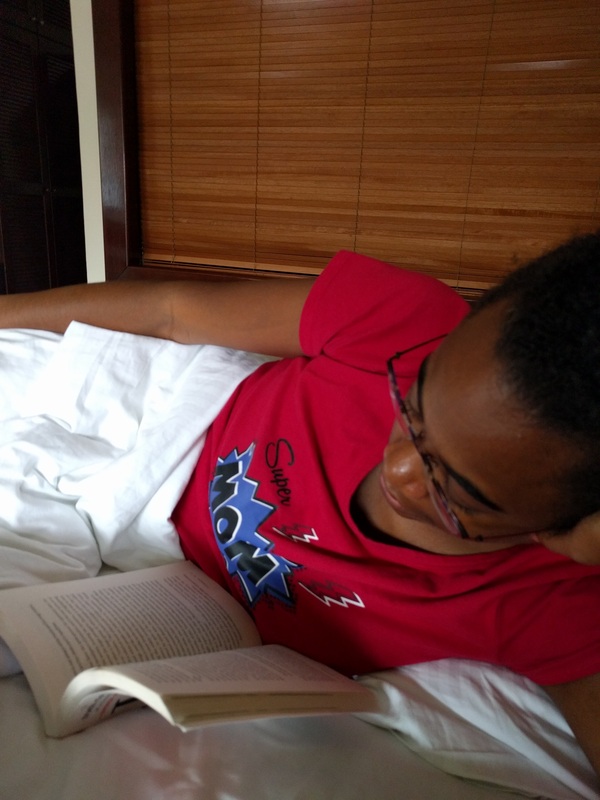 Changing her major to drop the pre-med due to struggling in Chemistry 101 (this Chemistry major understands the struggle) to finishing in pyschology, an area she loved. She spent 8 years writing for her blog before she received any compensation. When asked what she would do differently, she said she would get paid earlier. There were many full circle moments for Luvvie where her break began when Shonda Rhimes tweeted about her Scandal Recaps. Later, Shonda would go on to endorse her book and is now turning the book into a TV series. 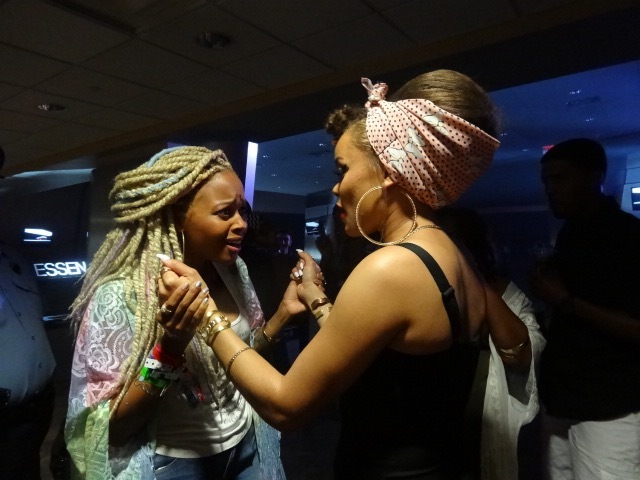 Luvvie expressed her gratitude for Shonda to help bring her up along with her. Now Luvvie is carrying the torch to help someone else as well. That is her mission of the Red Pump Project, which started as a campaign turned into a foundation. The Red Pump Project is to bring awareness to HIV/AIDS for women and girls and to help eradicate it. Luvvie acknowledges that she has been blessed to use her gift and talents while meeting the right people at the right time, orchestrated by God. What I loved most about Luvvie is her transparency about not always being ready. 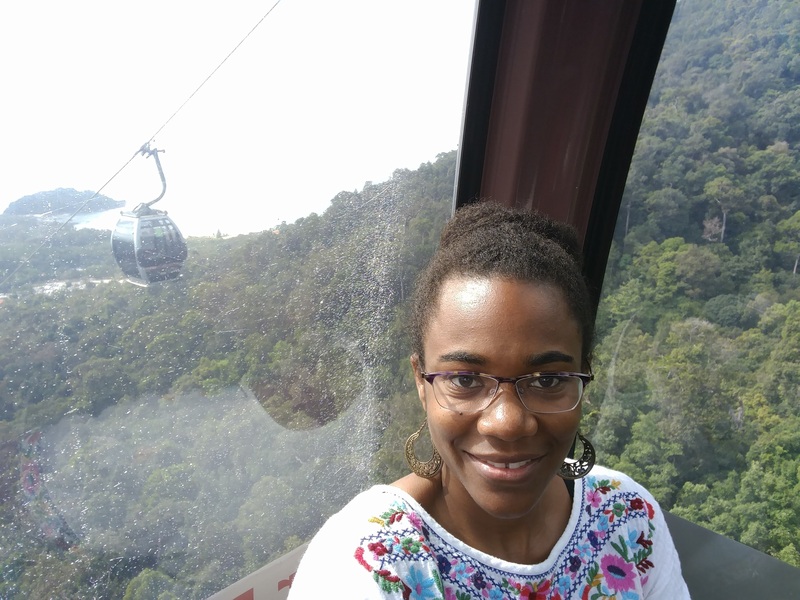 Though she set out she would be a New York Times Seller years before it happened, she realizes that though she forgot about the goal (among others), declaring the goal was half the battle. There is something about being intentional in setting goals that helps begin the wheels of accomplishing them — even if, they are years later. 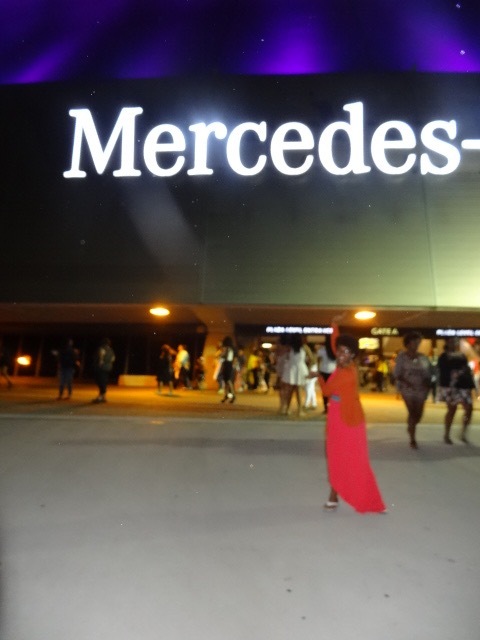 One of my favorite festivals is the Essence Music Festival in New Orleans. This will be my third year attending so I feel like I am a veteran. With less than a week away, I wanted to give my tips for Essence to help you navigate successfully this year or for years to come. 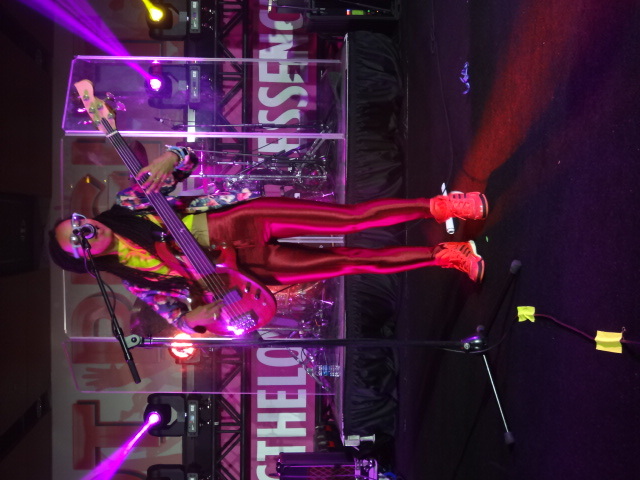 Essence is one of the few conventions in New Orleans that requires an up front in full deposit for ALL of your nights (non-refundable). Due to the policy of inflexibility, I suggest waiting until about two weeks before to book housing if you plan to stay in a hotel. You will be more likely to fulfill your plans and get the best rate. This is also a great time to use loyalty points or loyalty points with cash. I have noticed booking direct with the hotel is more cost effective than the Essence website. The first year I booked the hotel almost a year in advance and saw no benefit in prices than the second year when I waited until 2 weeks before. If you plan to use something like AirBnB, you might want to do that earlier. I recommend getting a hotel in CBD. The best value if you plan to attend concerts is to buy the 3-day pack. My other trick is knowing most of the artists I want to see will be in the superlounge, I get the highest and cheapest ticket I can find. Last year, I sat in my seat for maybe 1-2 acts. The rest of my time was walking the entire Superdome between the two lounges. The schedule is also pretty tight. This year, I got more sophisticated with a priority system knowing I can’t see everyone. I took off people that I either did not want to see or have seen already and don’t have to see twice. My first priority is seeing artists I have not seen before and always wanted to see. Your essence festival will be a wash if you choose to do too much. The first year, I didn’t have tickets to a show (though was blessed with a ticket to Beyonce at the last minute XOXO). I did the party track…and that is one of the last times I got home at 6AM (which caused me to sleep until 6PM.) The party hard plan worked because we did not have concerts to attend. Yet, when you have shows, sometimes the artist you want to see is scheduled early. There are no ins and outs for the concerts, so you are stuck if the other one you want to see is at 10PM. Last year, I had to see Goapele and she was one of the first acts. I don’t regret getting there early to see her. She was amazing. Yet, if I had been partying all day, I may have missed her. The one regret I had last year was not knowing about Solange’s party in time. This year, I am prepared and have already purchased tickets for both days. Will make sure I eat my wheaties! 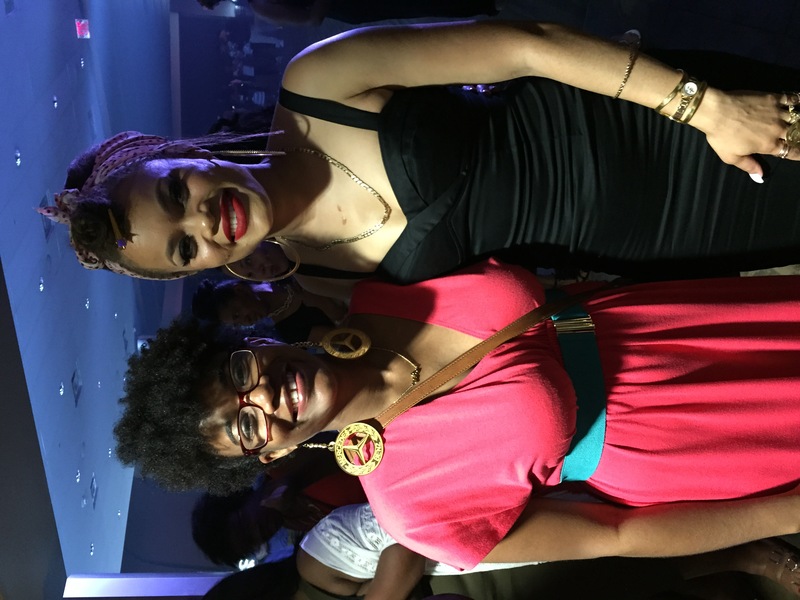 Most people at Essence are there to have a good time. So, if you meet someone, don’t be afraid to be cordial. Yes, New Orleans is a city where you have to keep your eyes open, yet being overly cautious could have you missing out on a genuine connection that could last beyond your trip. Despite food being sold in the Superdome and the Convention Center by vendors, I recommend at least a few good meals outside. 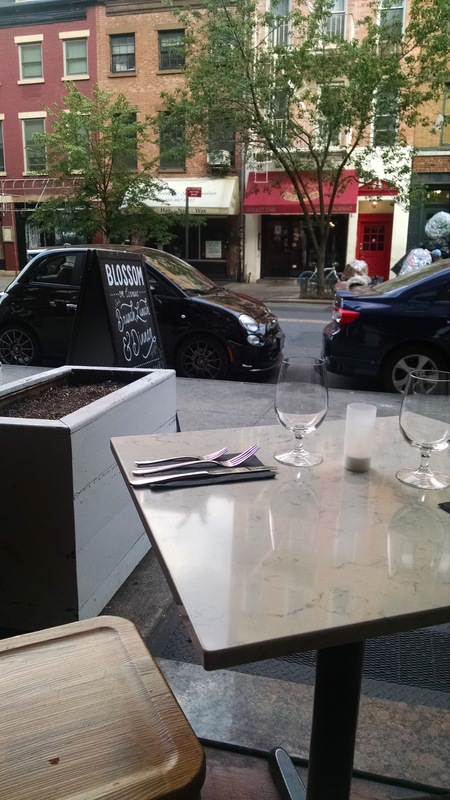 For some of the more popular restaurants, reservations are required ahead of time. We were able to get in Commander’s Palace and Compere Lapin and loved it. There was another restaurant we booked at the last minute on open table and it worked well. Others book months in advance. Some years, I have had a terrible time getting cell phone coverage. It really threw off plans especially when in the Superdome or in the hotel. Have people’s hotels and room numbers as a backup just in case you have to leave a message the old fashioned way. 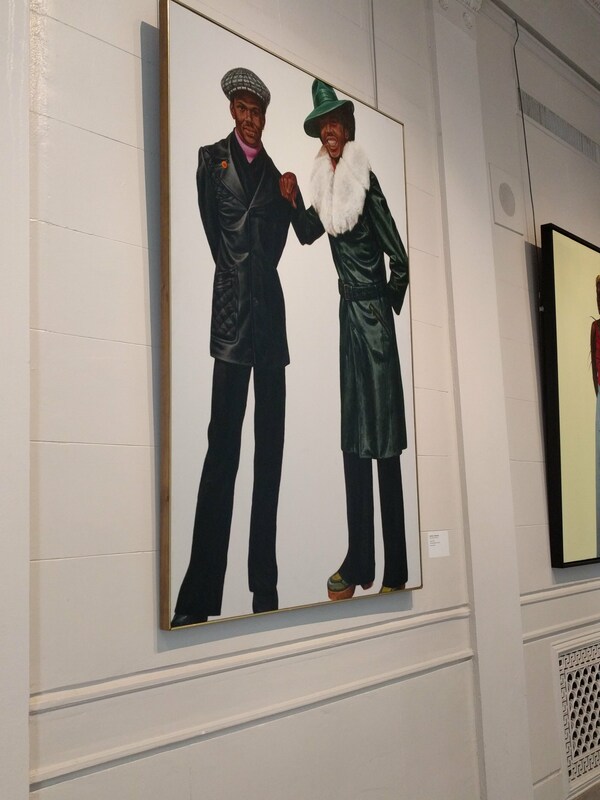 Last year (and this year) I attended the Walker’s Legacy Brunch. For women entrepreneurs, it was a great place to come together for a couple of hours and mingle. There are also all types of side conferences happening at Essence such as business pitch competitions, hair product showcases, etc. Keep your ear to the ground in order to find jewels off the beaten path. Essence has changed significantly over the years but what has remained constant is the amazing experience. Some people who went in the early years feel like it is too commercial now. I can’t compare as I am a newbie but it is still a great place to have the family reunion you never planned to have. I always run into people from all over and also make sure to make new friends. 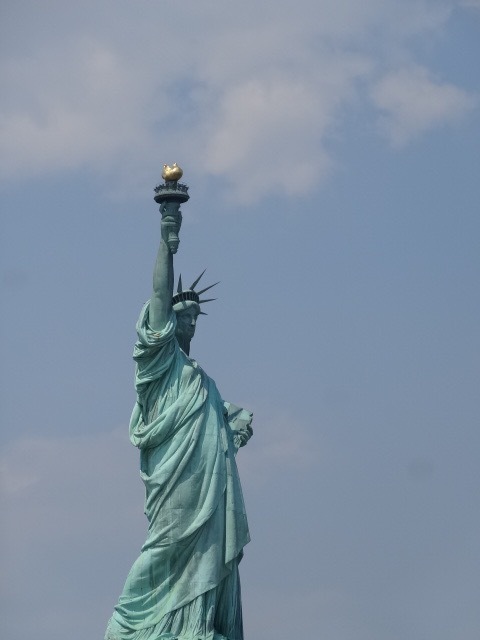 It has been almost two years since I visited New York City. My schedule was so packed I had to document a schedule in Tripcase. I followed the schedule precisely. In addition, I learned that starring places of interest in Google maps came in handy. When I searched for directions, it would show the starred locations on the map, reminding me that I was near a point of interest. I needed all the help I could get navigating this small in size yet lengthy to navigate city. Despite the need to meticulously plan journeys, I was able to recharge on New York’s explosive cultural arts scene while having mini-reunions with friends in between. Arriving, late Wednesday I wisely chose a hotel near LaGuardia Airport. Despite using points for the stay, Holiday Inn LaGuardia offered me a snack with water or a credit of 500 points. I was parched so went for the water. The hotel was aged but with the free shuttle from the airport and friendliness, I enjoyed my stay. Thursday was quite a worldwind. I moved to the upper east side to the Courtyard on 92nd street. It was a bit far from the train and did not have a restaurant. My intention was to spend most of the time in Central Park and Harlem but I unexpectedly picked up a hair appointment a Devachun in Soho, so that took up a chunk of my day. I have had a DevaCut by my stylist Gerri at Planet Curls in Houston. Ultimately, my hair came out about the same. The $50 surplus in the NYC price definitely covered the ambiance and service. I loved the shampoo bowl where I was practically lying down for my wash. My stylist April was very kind and accommodating. She even allowed me to order delivery (because of the slowness of the train from uptown, I made it just in time for my appointment…and hungry). Despite finding 2 eyelashes in my Pad Thai and it being barely average, I was happy to eat. Overall, I felt like I was treated like a queen, but the frugal in me will continue getting my Deva haircut in Houston. I cannot go to NYC without going to Century 21, a discount designer department store. When I interned in NYC, I shopped there every day (my take home savings to prove it). Despite not needing anything, it is definitely a part of a ritual to go to the Cortland store. I attempted to squeeze it in before our show. Yet, reality sank in, I did not know the trains like I used to. I followed directions from Google maps. I recalled the directions saying take 2 stops. Yet, somehow, I was on my way to Brooklyn. What was planning to be a quick shopping trip turned into an hour accidental train ride. On the way back, the 4/5 decided to stop service. They finally notified us after having us sit for 10 minutes. I shifted plans to get back to times square as the show was at 7pm with no late seating. The Houstonian in me got off at Penn Station with the intention of getting off at Times Square. I was able to swing through Macy’s to get a shopping fix (though downgraded from my Century21). I traveled all 7 floors and after seeing a juice bar and Louis Vuitton in Macy’s I quickly realized I was not in Kansas. I picked up two items. Thankfully, I had my Plenti card on me so received points for the purchase. I walked what felt like an eternity to 45th street as cabs kept passing me (I do know how to hail a cab) and Uber was surging. 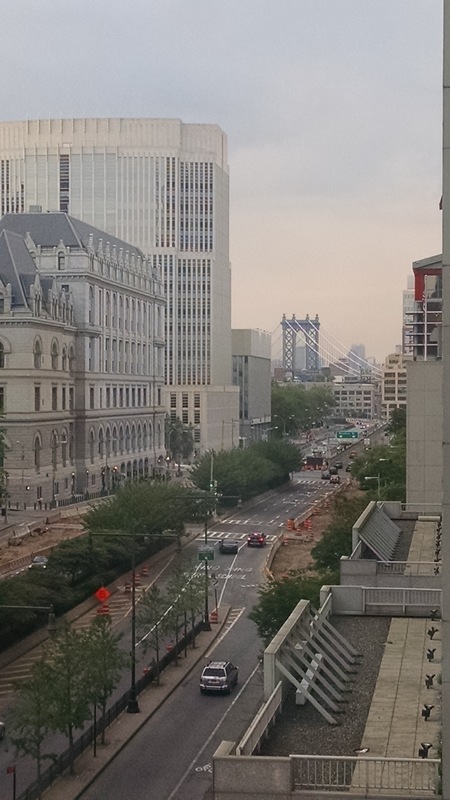 I was able to see the Empire State Building ans Madison Square Garden on the way. The Memorial Day holiday weekend was all a buzz, yet New Yorkers were preparing to get out of town. 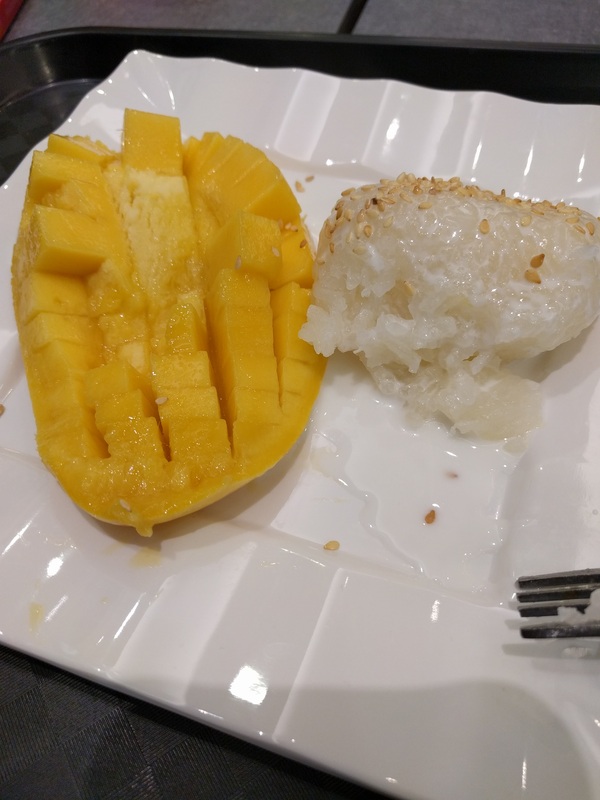 I finally made it to my 5pm dinner reservation still full from my hairy Thai food. Unfortunately, all the food was family style. I finally settled for eggplant parmigiana and begged my friend to take the remainder home. I was amazed at how fast my food came out. Yet, disappointed that it was very cold. So much that my cheese barely melted. Again, another meh meal. I was near the show which at this point was all that mattered. I sat in my seat waiting in anxiety almost as high as a few weeks ago for Beyonce’s concert. I was able to glance quickly at the program. There was an insert program for the original production of Shuffle Along. As usual, I had not done any homework. I wanted to take advantage of seeing my favorite actress for the 3rd time before she went out on maternity leave. I was in for a treat. The play within a play covered a production of Shuffle Along from 1921. The show was the first all black production to make it to Broadway. Unfortunately, the blaring truth was staring in our faces. 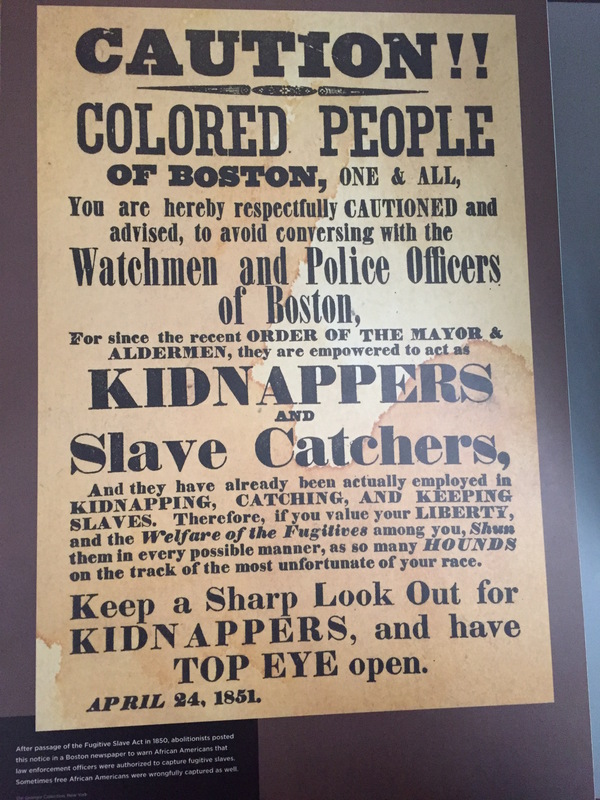 Not much has changed in the last 100 years. I was pleased to observe the increased diversity (Hamilton, Eclipsed, The Color Purple, Misty Copeland etc. ) throughout the arts but it feels like the industry is moving in snail’s pace for sustainable changes to occur. In addition, how many productions are run by people of color on the business side of the house. Like Hollywood, New York is still a very closed network. 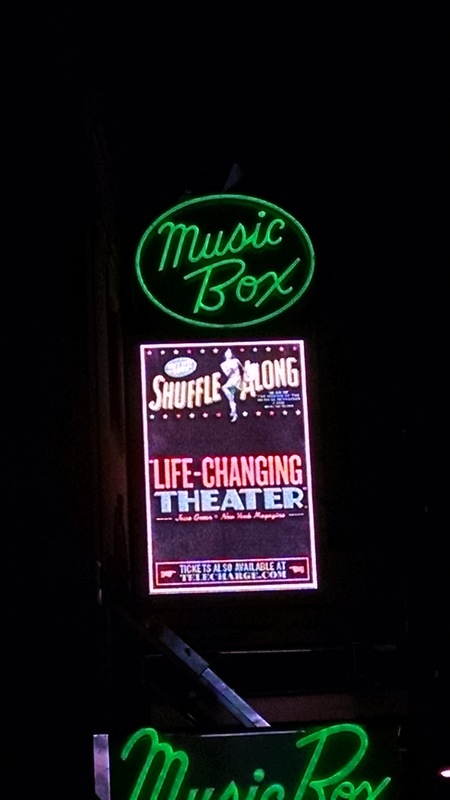 Shuffle Along was a great reminder that it was pretty much the same in the early 1900s. The performance was phenomenal. Audra McDonald was clearly showing and glowing. She moved in those tap shoes as if she had wings. I kept thinking, will my joints allow me a few shuffles in my taps. It was very hard to keep still. Savion Glover choreographed with perfection. I learned so much about the writers of the show. The entire time I kept thinking, why have I never heard of this show before! Shuffle Along was the first Broadway show written and performed by an African-American cast. The show was written by Flournoy Miller and Aubrey Lyles with the score by Eubie Blake and Noble Sissle. The show ran for 484 performances . Greats such as Florence Mills, Josephine Baker and Paul Roberson performed in the show prior to their fame. We were able to spare some time to hang out for autographs at the stage door. 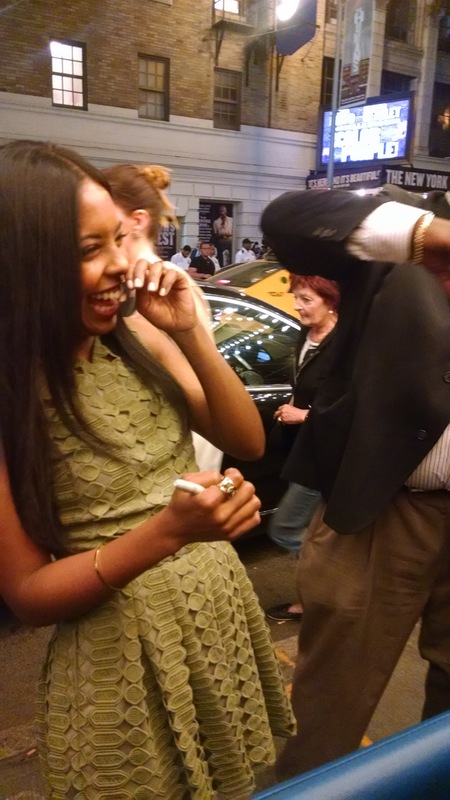 As I waited, I noticed the other shows on the street: Les Mis, Eclipsed and The Color Purple. All shows overcoming obstacles, yet surprising mostly with an African-American woman lead. For a split second, I could taste progress. We were able to get a few autographs. While I waited, I received a push notification from Uber that it would give 50% off 2 rides for the weekend. Perfect timing. As we walked to the Uber giving up the chance to see Audra, a woman told me she snuck out the front doors. I was relieved to miss her but also feeling bad that she must be exhausted with her pregnancy. We were very lucky to see her. On the way back to the hotel, I saw a whole foods. I asked the driver to stop. It was 10:30 pm and I was shocked it was still open. It closed at 11pm. Again, I was parched but more so in need of alkaline water. I spent $2.99 on a bottle of Evamor out of desperation. I walked back to the hotel but upon arrival realized it was one of the least favorite hotels of my stay. I definitely, was not happy with their service. The next hotel made up for it. The Renaissance Midtown was in the middle of everything. It was new, modern and great service. I would definitely stay there again. I was able to get to the train very quickly. 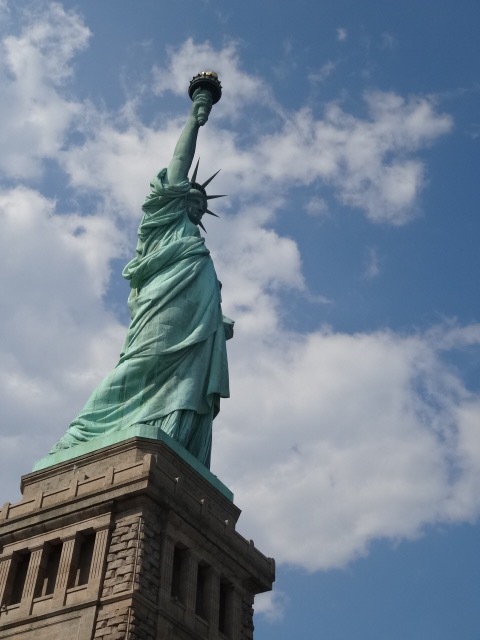 A beautiful and hot day was spent at Ellis Island and the statue of liberty. It took about an hour to get through security. Yet, it was all worth it. Despite missing my pedestal tour that I reserved because they stopped allowing people up at 3:30pm, it was fun to be a tourist. I also had a strong sense of paranoia as the statue is threatened daily. The Department of Homeland security has a building there. 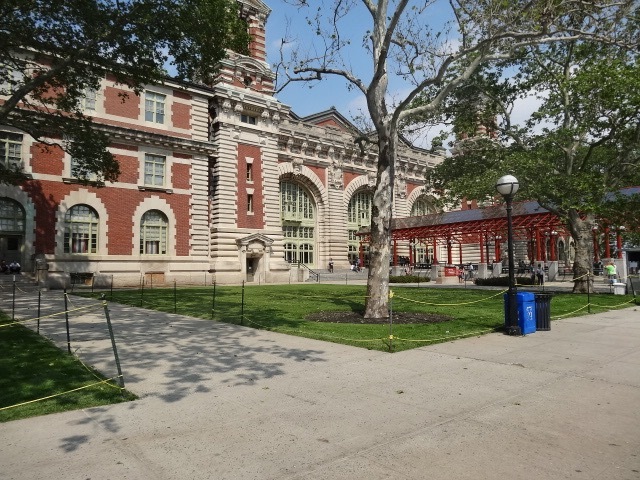 I decided to visit Ellis Island first. I was not prepared for the emotion that overcame me. I began thinking about people that came over to this country searching for hope . With the conviction that they have a chance to build their American dream. 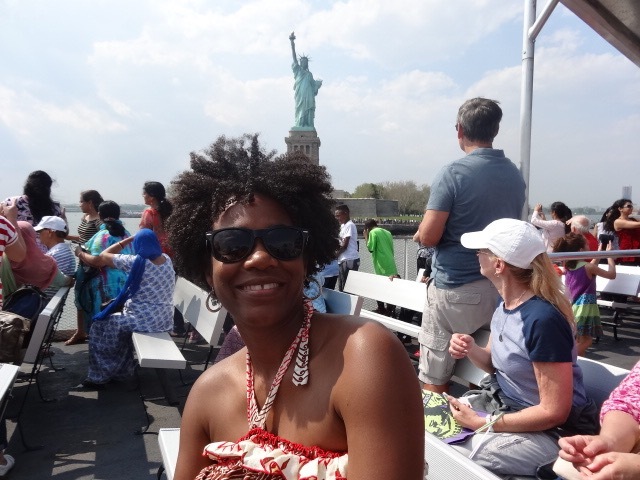 For many years, I thought being of African descent that we had no connection to Ellis Island. That was until I found my Jamaican grandfather’s name in the records. Yet, while visiting the national park store, there was no reflection of my heritage. There was merchandise reflecting those of European descent. I took a moment to reflect and thank God for giving my grandfather the opportunity to leave Jamaica, come to America at 19 and build a family legacy that lives on. On the way back, I walked to Century 21. I had to push back dinner reservations but went against whatever forces that were trying to get me away from my store. As usual, it was a madhouse. I gave up trying to get sunglasses. I was able to pick up a few things but I was definitely rushed. I was also able to get a glance of Oculus from the outside. What a beautiful structure. The next mode of transportation was the bus. I took the bus to the dinner reservation which was about 20 minutes behind due to traffic. I rarely take the bus in NyC but it was a bit less crowded than the train. I didn’t learn until later that the MTA now has wifi. I missed several messages while underground on the subway. Dinner was back in Soho and quite delightful. 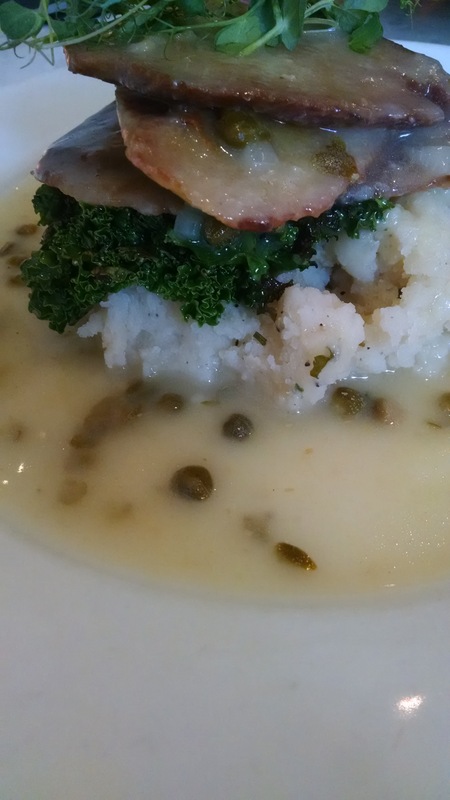 Who would think my best meal in NYC would be at a vegan restaurant. Blossom on Carmine was great. The ambiance was calm and being near the open window directly reminded me of dining on patios in Europe. Very peaceful. I was also grateful they let us eat after being 30 minutes late. 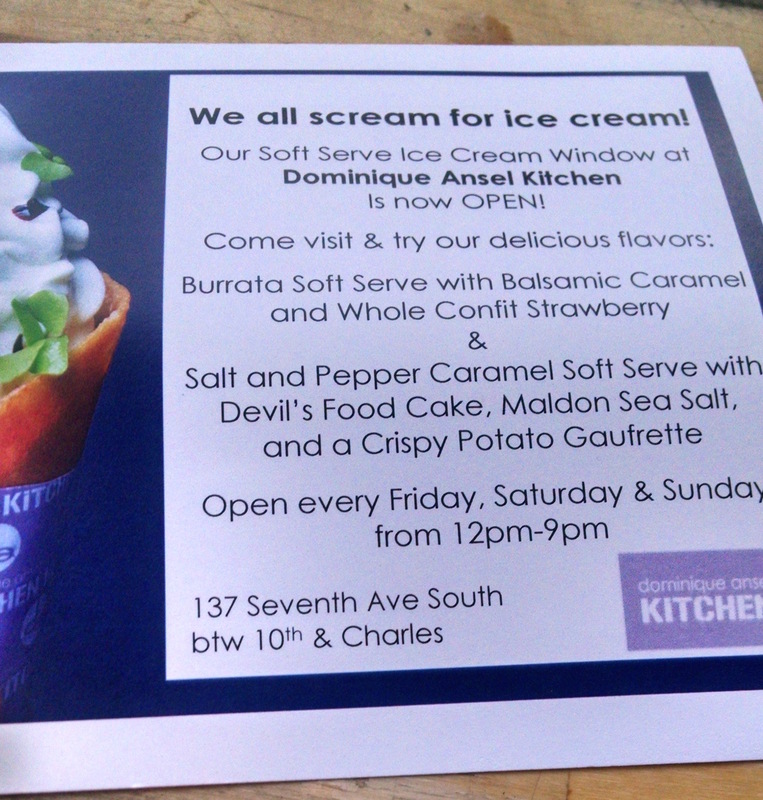 We had dessert at Dominique Ansel’s kitchen. 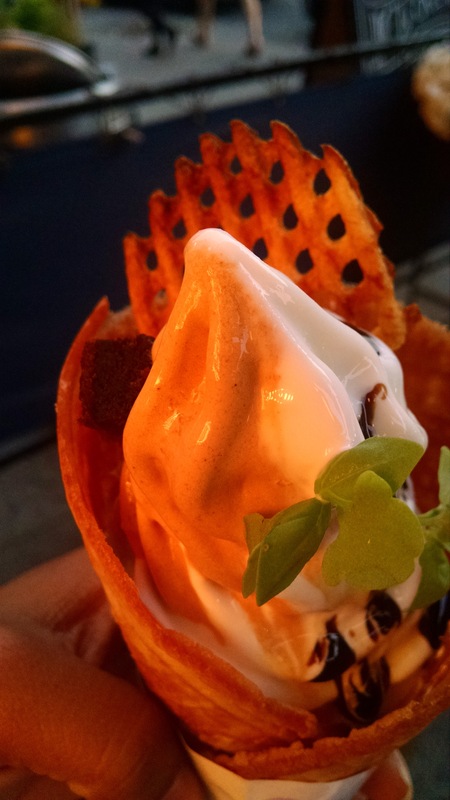 I loved their new soft serve sweet and savory cone. Yet, people around me gave it mixed reviews. I heard it taste like cold cheese. A passer by said the desserts were terrible. I had the swirl. It was worth every calorie. A complete oasis experience. In addition, I felt their service was excellent. The location was also close to the 1, making the train ride home very easy after a long day of walking. Saturday, I was excited to use my Marriott voucher for breakfast at Rockin Roscoe, a restaurant in the hotel. I was surprised to learn their oven stopped working. I settled for the lox and bagel and yogurt with granola. It was pretty good. I actually didn’t need much as the next meal event was only in a couple of hours. We ate Rosa Mexicano directly across from our show at Lincoln Center. I recognized the flying men on the wall. I think I ate there before in Atlanta. Despite the beautiful guacamole preparation at the table, I was very disappointed in the food. I try not to eat Mexican food outside of Mexico, California or Texas. It was borderline school cafeteria food. Not good. Yet, very convenient to the show (there seems to be a trend here). We left the restaurant at 1:45 for a 2pm show. We had plenty of time to spare. 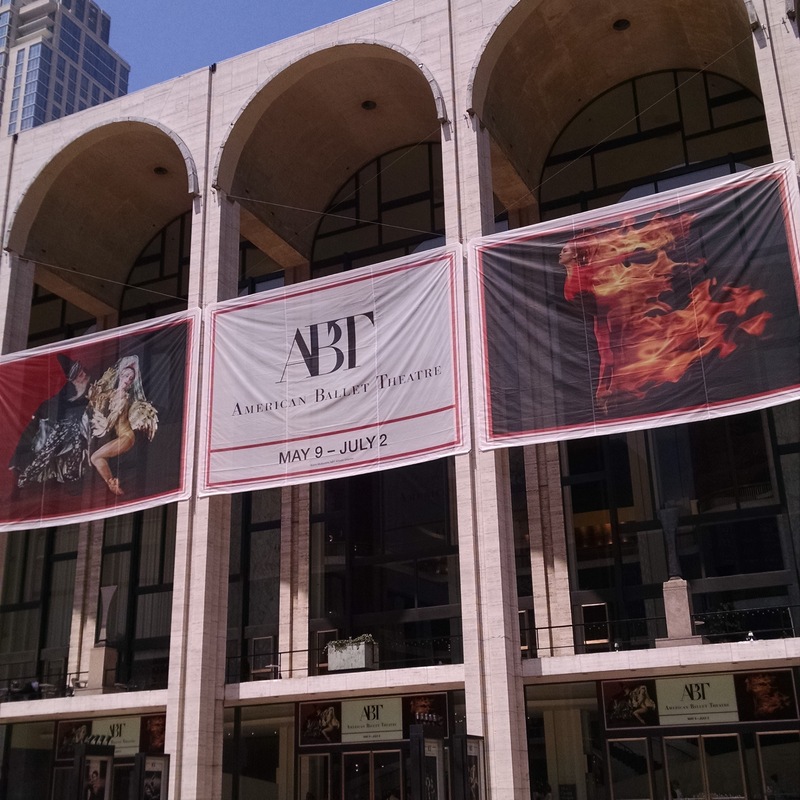 I was so excited to see Misty Copeland. She brought so much flavor to La Fille mal gardee. I realized halfway into act one that it had been a while since I attended a traditional ballet. The soothing music coupled with a carb filled lunch was the recipe for a nap. Despite several nods, the show was great. I even had a chance to stop by another Century 21 on 66th….but was in and out very quickly. Their selection wasn’t anything compared to Cortland. I finished the weekend in Brooklyn at a benefit for For Life, Inc. I really wanted to get to Brooklyn earlier as the Dance Africa festival was there but I ran out of time. 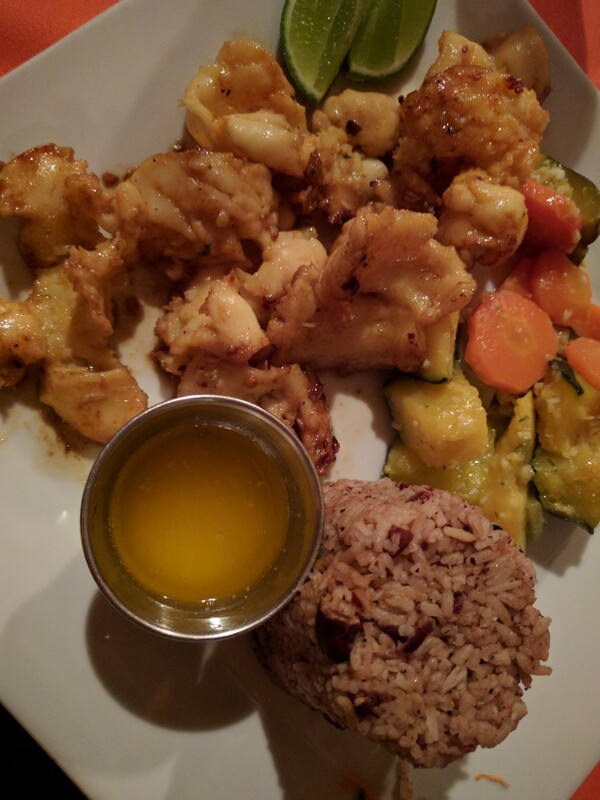 The benefit was great as it was the first annual fundraiser to help children in Jamaica and Cabo Verde.The food at the restaurant, Amarachi was very well seasoned and good (finally). New York will always be my hub of international creativity. The energy is recharging. Despite being disappointed in most of my meals (Houston spoils me), the access to high quality art outweighed my disappointment. I’m finally back in fat city ready to get my grub on yet happy to be recharged on the energy and culture of wonderful New York. This week Counter Current kicked off with a weeklong of outdoor experimental art performances. I have been anticipating many of the events (s/o to Jason Moran) but somehow forgot I signed up for the Remote Houston event. I received a reminder two days ago with details and realized I needed to shift my calendar to fit it in. As usual, I did not recall the details but figured we would experience art outdoors. What happened during the experience was not anything I ever imagined. The reminder flyer clued me in that we would be wearing headphones during the performance. I also knew we would be at a cemetery. Any other time, I would be completely freaked out about going to a cemetery….but for the sake of art, it did not bother me one bit. If I weren’t rushing, I would have been able to read a bit more about what we were doing but I read enough to know I had to rush over to get there in time. We were instructed to be at the Alley Theater by 3pm with a sharp departure at 3:15pm. I am notorious for showing up to everything late (including flight departures) so was very concerned I would get left. I knew we were taking the metro train. Since, I have taken it only twice, I knew I needed to be with the group. I had not even looked at where the cemetery was on the map. I was going to uber over but realized the Rockets and Astros would be playing. To avoid the surge, I drove downtown arriving exactly at 3:02pm. Thankfully, I was able to find a metered parking space which cost me about $6. I scarfed down the rest of my lunch. I grabbed a plastic bag as 0 of my 3 umbrellas were in the car. I ran to the lobby feeling completely unprepared (especially as they urged there would be a lot of walking and to wear sneakers. I had on clogs with no socks…we will get back to that later). Upon arrival, we were given a metro card for the train ride and a waiver. 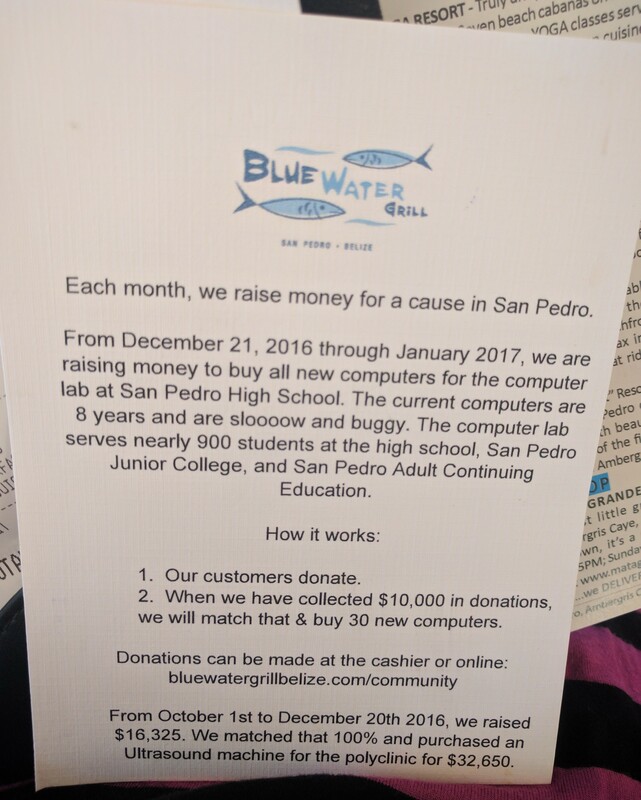 I filled it out and noticed we couldn’t sue them for any harm (what in the world is this event) and we had to pay $100 for the headphones if we lost them. We had about a group of 10 people who walked to the train together. I was so happy I made it in time. When we arrived to the cemetery, we had to fill out a second waiver and I was really wondering if they were going to lock us in the cemetery. We also were escorted from the train platform to the cemetery by a police officer. Do you understand my concern? We signed up for our headphones and stood around until everyone gathered. The crowd grew to at least about 35 people. Once the performance began, we were instructed we could no longer use our cell phones or talk to anyone. I went into slight panic mode but was calmed down by our computerized tour guide, Heather. We had enough to keep us busy during the performance to forget the restrictions. Our first assignment was the beginning of many that were out of the ordinary. The cemetery was in the East End. 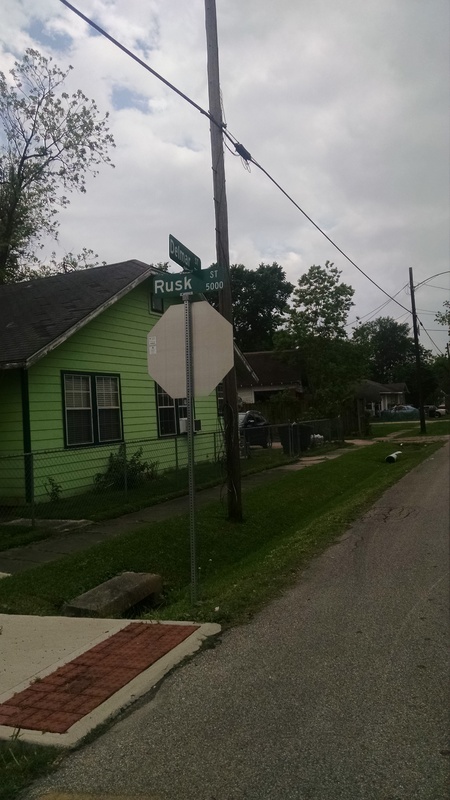 A part of Houston, I had never visited at length. Many of the grave decorations reflected the traditions of the Latino community. We were told to find the grave that drew us. 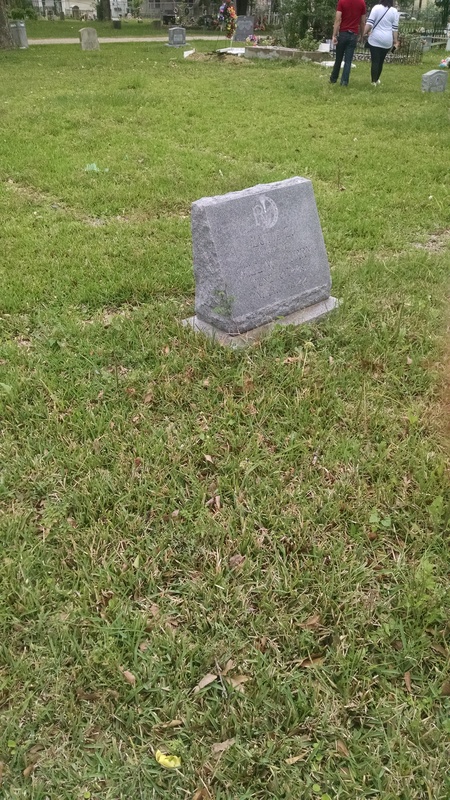 Instead of finding one with plastic flowers, a cross, or Mary, I found a grave that had nothing but a tombstone (though later so one flower far off in the distance). We walked into the neighborhood as a group which was just the beginning of people observing us trying to figure out who we were. The entire performance turned into a mindfulness workshop. We were observing everything around us which was a refreshing contrast to our normal 2016 customs. She named our group a “hort” I believe (she had a strong robotic accent), as in cohort. We were to do everything together. We made it back to the train and had to ride that together while still making many observations. 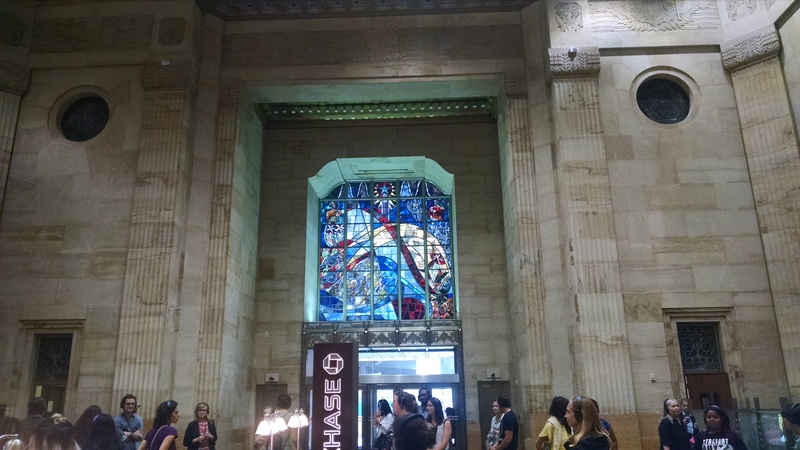 We eventually ended up in the JP Morgan Chase building (1929) which was absolutely gorgeous. I had never seen the large restored stained glass windows in the retail bank. We had an assignment there which included a wonderful dance break. After our dancing, we somehow broke our “hort” into smaller groups. This is when it really became interesting because we obviously started having different instructions depending on the group. My group left first and we went to the observation tower. Though, this was my second time in the tower, it was my first time I could actually see outside. The first was a terrible bit of fog. We started observing the activity 60 floors below us like I had never done before. Heather talked about how the cars seemed like how our body operates on a molecular level, where the roads represented our arteries. Despite knowing there were people below, you barely saw any. We continued on still not allowed to talk or speak. We were almost 2 hours into this journey and I began to feel like we were one. Heather reminded us on the beginning of our journey that each of us were individuals, looking different, yet we were 99% genetically the same. How often do we focus on our differences forgetting we basically are one. When we ended, the only reason I wanted it to end was because my feet were paying for not following instructions of appropriate shoes. They were practically on fire from all the walking we did. Nevertheless, despite me missing the #DrinkingAboutMuseumsHTX event, it was worth all the pain. 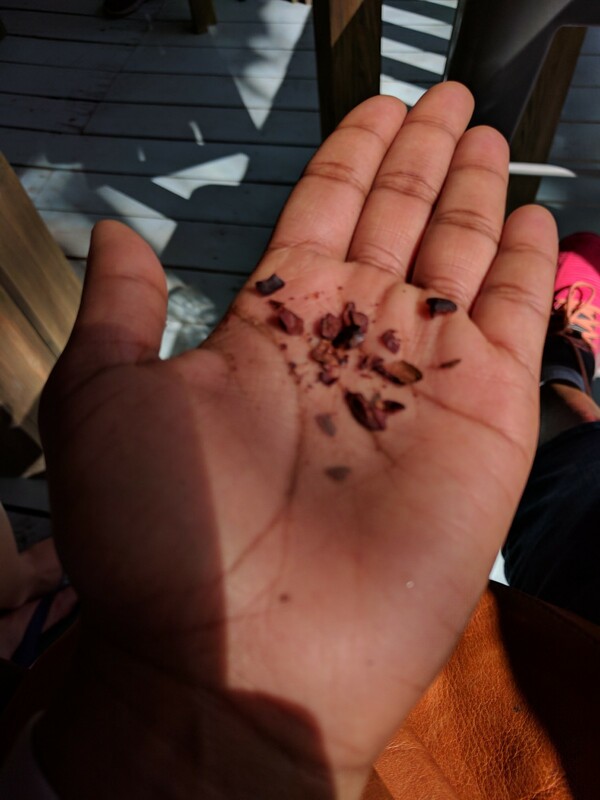 I felt like I was able to connect with how I used to be as a child. Free, alert and in the moment. The journey today definitely reminded us to spend time to smell the flowers, despite our adult wiring. Remote Houston was in partnership with CounterCurrent this week but will operate throughout May 13th. For more information, see here.